When one thinks of Martin Goodman and paperback books, the very first thing that pops into mind are his Lion Books and Lion Library lines of paperback reprints. Yes, I know, there were also Lion "originals", but the line was primarily a reprint line, issuing over 408 titles from 1949 to 1957. The history of Lion Books will be the subject of another time. What most folks don't realize though, is that Martin Goodman had an earlier paperback line, a small blip on the radar of his publishing empire that required absolute minimal in the way of production but over 70 years later has left some truly cool artifacts for us to examine today. These weren't really paperback books in the traditional sense. They were thick, slightly over-sized digests that reprinted hard cover crime novels of recent vintage. For our purposes, the publisher we want to examine is Hillman Publishing, who published under a sub-publishing company called Novel Selections, Inc. NOVEL SELECTIONS / NOVELS INC.
Why am I spending so much time on Hillman? Because the digest format they popularized was copied across the board by all the other publishers, even so far as banners, titles, etc. The novels reprinted were purchased cheaply and they were cookie-cutter publications, probably all from the same printing and layout source, only differing by virtue of the indicia, which has allowed us to be able to figure out just who was publishing them. It really seemed anyone with some money could jump in, find a source of cheap, recently published novels, and place a print order through the same source as everyone else did. They all looked the same! 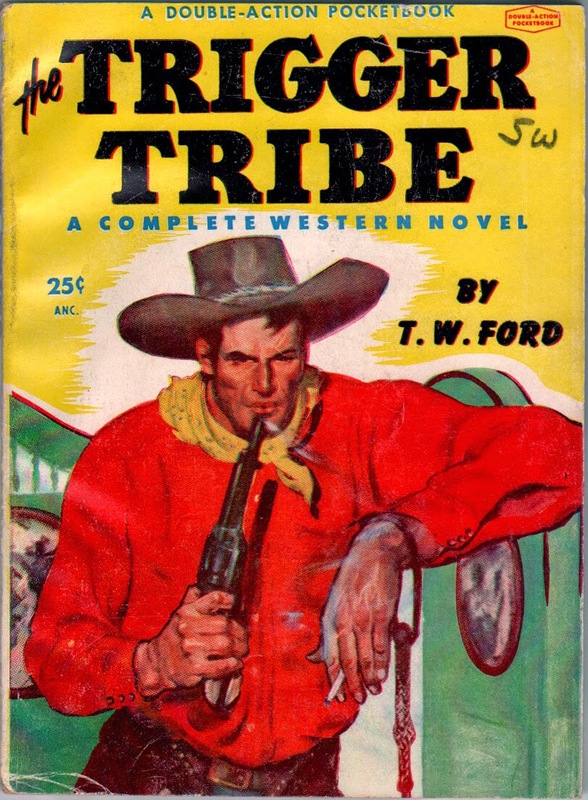 The big genres were crime and western novels, just as were the contemporary pulps. While nearly all the publishers seemed to publish these digests, it appears that the smaller publishers gravitated towards them because of the likely inexpensive start-up costs. Quite simply, they were low end, printed on cheap paper with stiff covers, with paper seemingly just a step or two up from traditional pulp newsprint. In 1942 Martin Goodman was also flush with profits generated by his war-time Timely comic book line. His Red Circle pulps were nearly dead and all effort and paper were being redirected and put into the comics, which were also being used as propaganda and morale boosters for the raging world war. 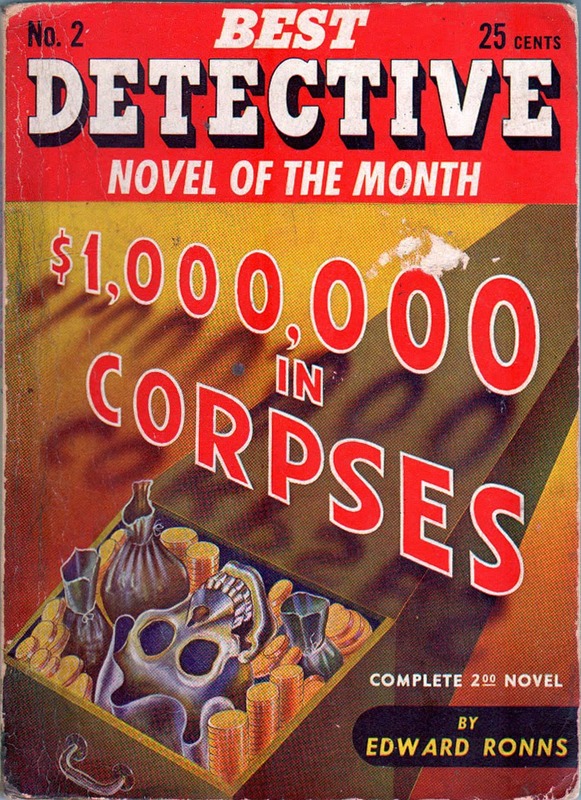 So with a cheap source of recently published hard-cover crime novels, Goodman took the plunge and initially released two lines of paperback crime digests, in the exact same mold as Hillman's. 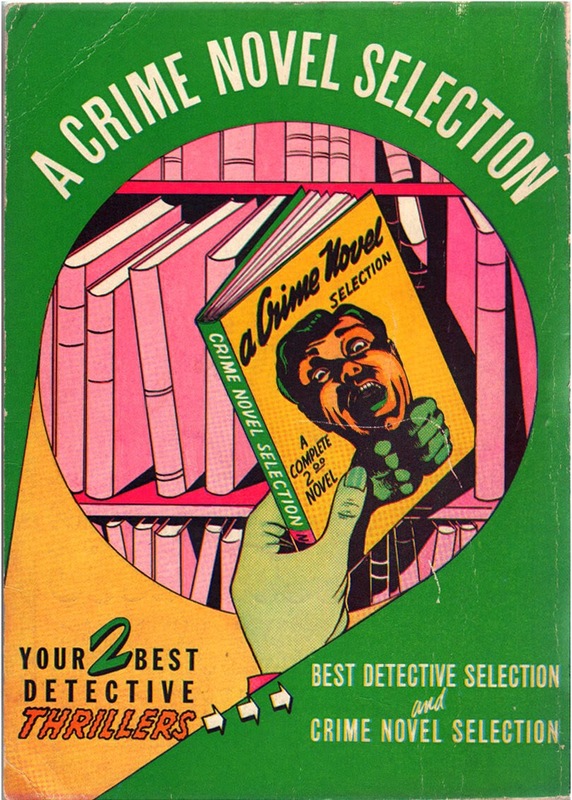 CRIME NOVEL SELECTION - ran 6 issues in 1942 and 1943. Notice the continued use of the word "selection" in both imprints, a word taken right off the Hillman Publishing Company sub-publisher, Novel Selections, Inc. Was this an accident? When considering Martin Goodman's newsstand strategies, my feeling is that there were no accidents. Goodman looked to see what appeared to be the most successful paperback digests on the stands and just copied the format down to the letter, hoping for readers to be confused as to what they were buying. 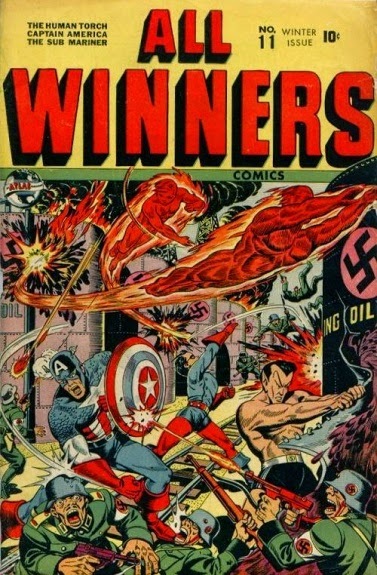 He even created a new sub-publishing company, Select Publications, Inc., to kick off these digests, a sub-publisher that would soon appear in his comic book line on such titles as singular issues of Human Torch Comics #10 and Sub-Mariner Comics #8, both Winter 1942/43 issues, possibly both planned this way to take the heat off from Hillman noticing the copycat tactics on the paperback digests. Goodman would be able to say he had been using them all along in his comic books! Later Nellie The Nurse, Blaze The Wonder Collie and a handful of romance glut 1949-1950 issues sported this same sub-publisher. As we will see below, Goodman then started a whole slew of other new sub-publishing entities for these publications, most of them familiar to us but all of them used for the very first time right here. So if you were ever curious as to the origin of many of the Goodman indicia companies used in various comic books, here is where they were created. The different publishers will be mentioned as they appear and at the end I'll summarize them all in a list. Cover artwork in many cases will immediately be recognizable as names already known on both pulps, magazines and comic books. For the most part, these are some of the least known Martin Goodman publications ever seen and worth a detailed look for posterity's sake. One last thing. As you will see, Some of the novels reprinted below were published with new titles. Martin Goodman got into a lot of trouble with the Federal Trade Commission over this tactic in both his pulps and paperbacks. 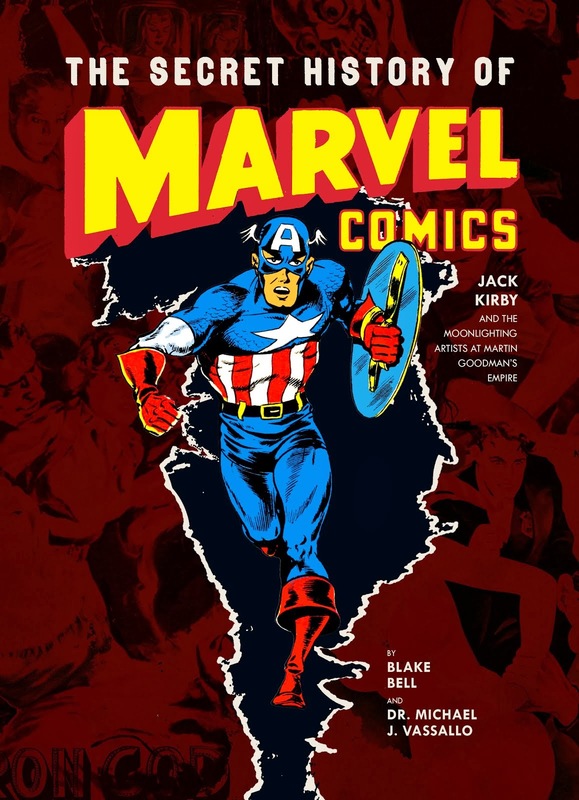 (See "The Secret History of Marvel Comics" for additional background on this). Nothing is noted inside these books in the earlier releases. Then lo and behold! 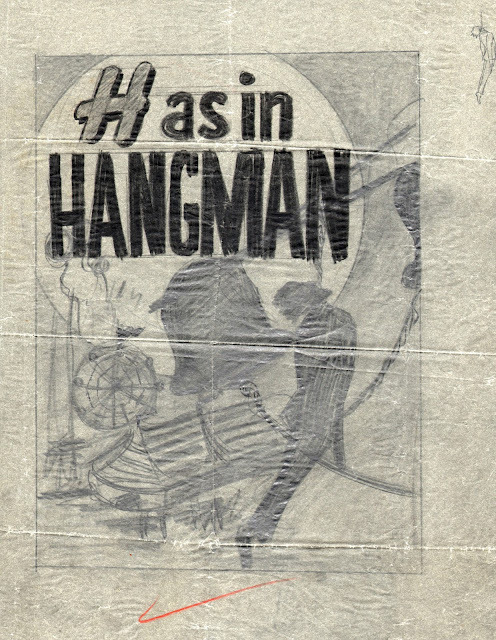 In the very first release in the Crime Novel Selection series below is a "stamped" addition on the inside front cover letting the buyer/reader know that the book was originally released under a different title, with an earlier copyright! All following releases then informed the reader of such and this "hand stamp" was likely forced after printing of the first book, by the FTC rulings. No. 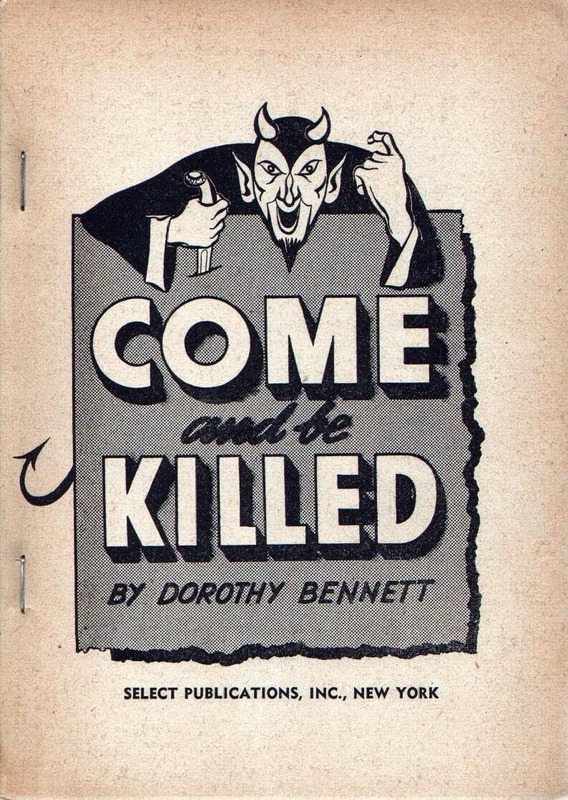 1: "Come and be Killed" by Dorothy Bennett; Copyright 1942 Select Publications, Inc., Cardwell Higgins cover art. No. 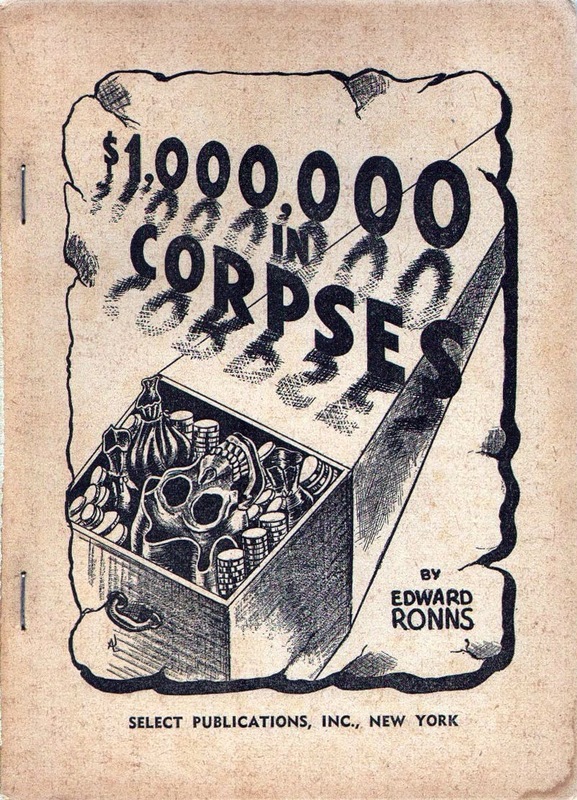 2: "$1,000,000 in Corpses" by Edward Ronns; Copyright 1942 by Select Publications, Inc. Cover art Cardwell Higgins (attributed). Here is the page one illustration the cover was based on. The signature seems to say "AJ" (It's "not" Al Jaffee, I asked him), which looks like the Cardwell Higgins initial as seen on the cover of the first release above (on the gun handle!). No. 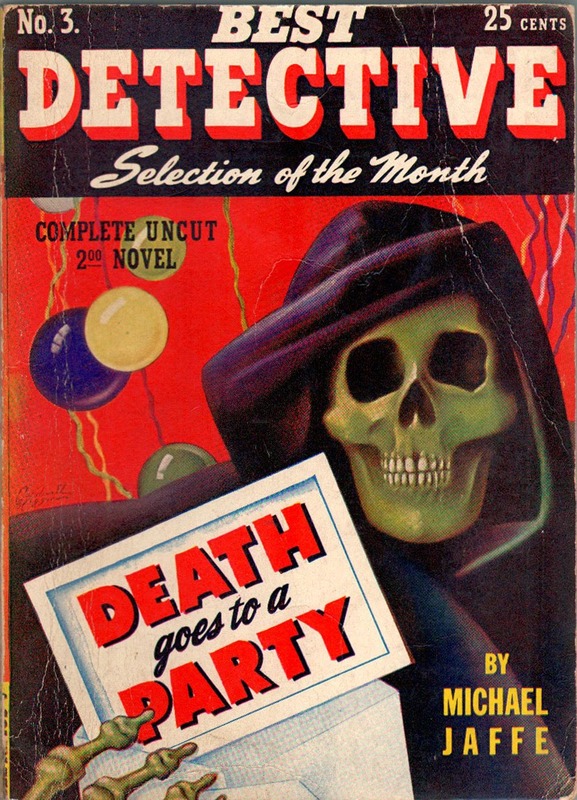 3: "Death Goes to a Party" by Michael Jaffee; Copyright 1942 by Select Publications, Inc. Cover art Cardwell Higgins. No. 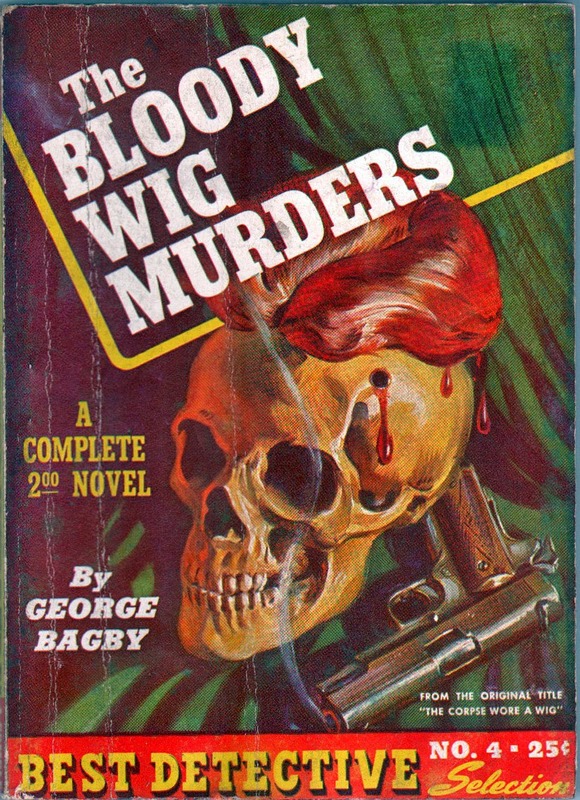 4: "The Bloody Whig Murders" by George Bagby; Copyright 1942 by Select Publications, Inc. Norman Saunders cover art. Copyright 1940 by Doubleday, Doran and Company, Inc.
Martin Goodman is now forced by the Federal Trade Commission to reveal the earlier, original copyright. No. 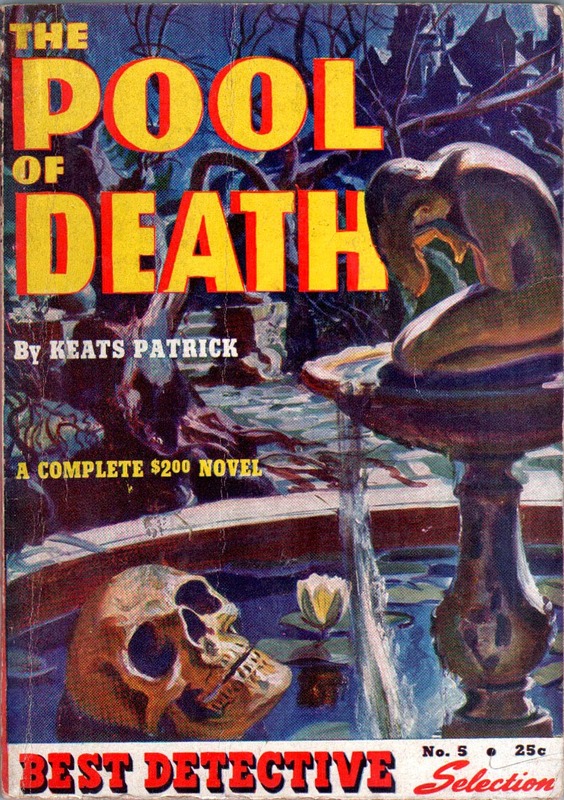 5: "The Pool of Death" by Keats Patrick; Copyright 1942 Select Publications, Inc. Norman Saunders cover art. Copyright 1935 by The Bobbs-Merrill Company. Originally published under the title : "Death is a Tory". This book is an abridgment of the original. Martin Goodman now reveals that the novels are both reprints and abridged. No. 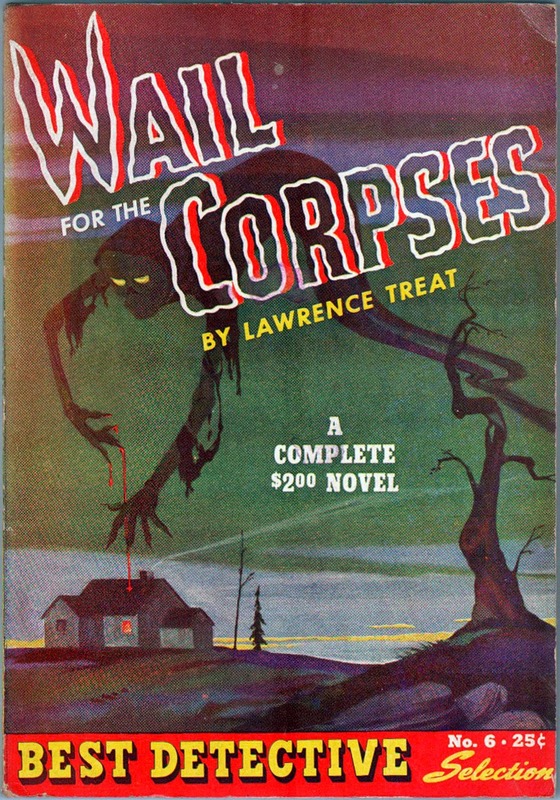 6: "Wail for the Corpses" by Lawrence Treat; Copyright 1943 by Select Publications, Inc., Martin Goodman, President. Cover art unknown. 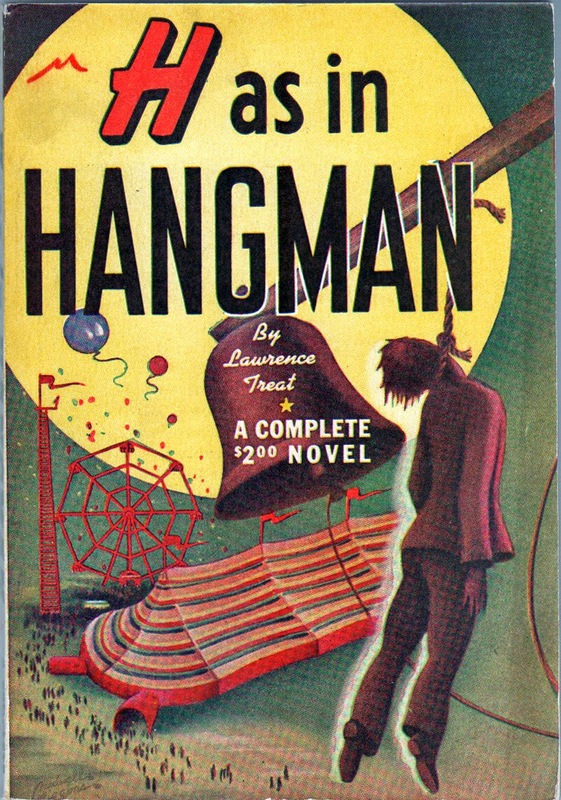 Copyright 1940 by Lawrence Treat. This book appeared under the title "B as in Banshee". An abridgment of the original. In this release Martin Goodman is identified as president of Select Publications, Inc.
No. 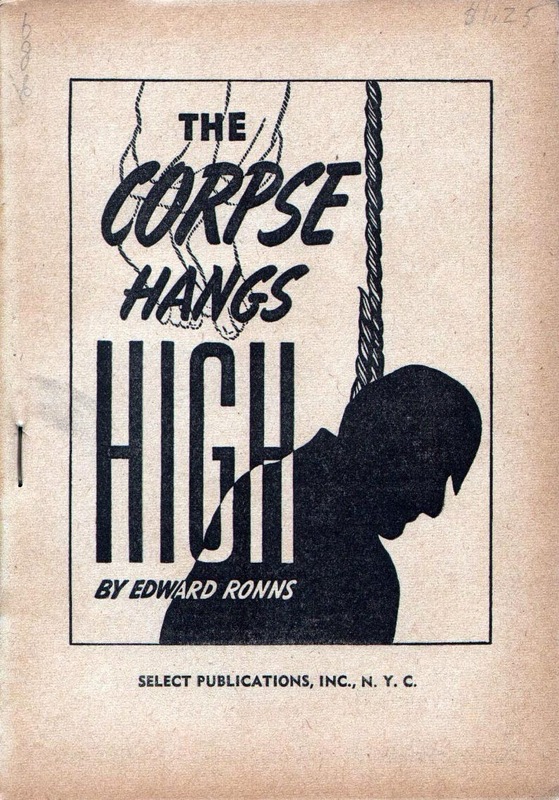 7: "The Corpse Hangs High .." by Edward Ronns. Copyright 1943, Select Publications's Inc., Martin Goodman, President. George Dunsford Klein cover art. (Yes, "that" George Klein). Copyright 1939 by Phoenix Press. An abridgment of the original. There is nothing anywhere in this book that identifies it as #7. 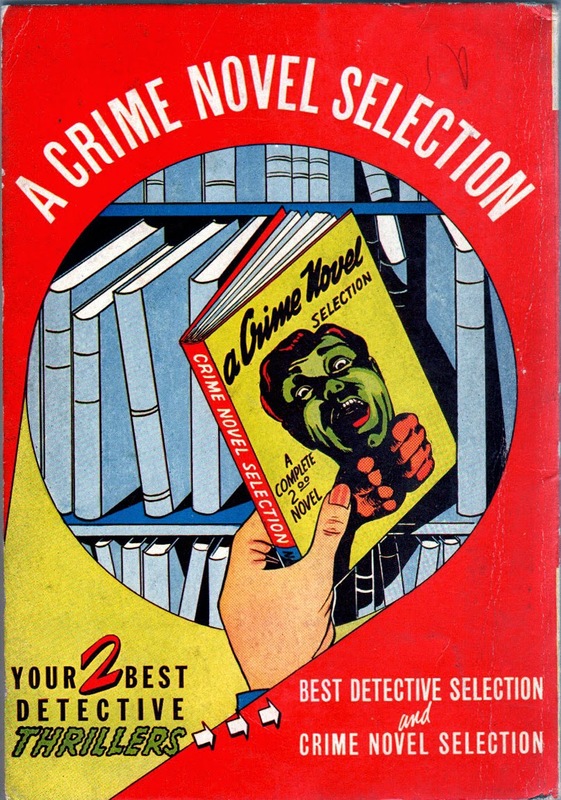 The identification comes from the inside back cover ad of sister series Crime Novel Selection #4 (below right image) whose cover coincidentally also sports a George Klein illustration, both books being published simultaneously on the newsstands. 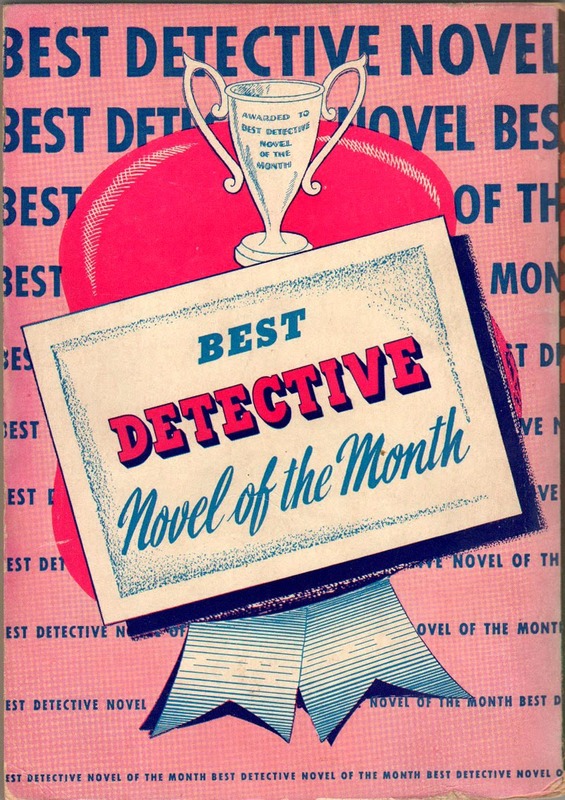 Also note the first appearance of the BDS (Best Detective Selection) shield colophon at the bottom lower right of the cover. No. 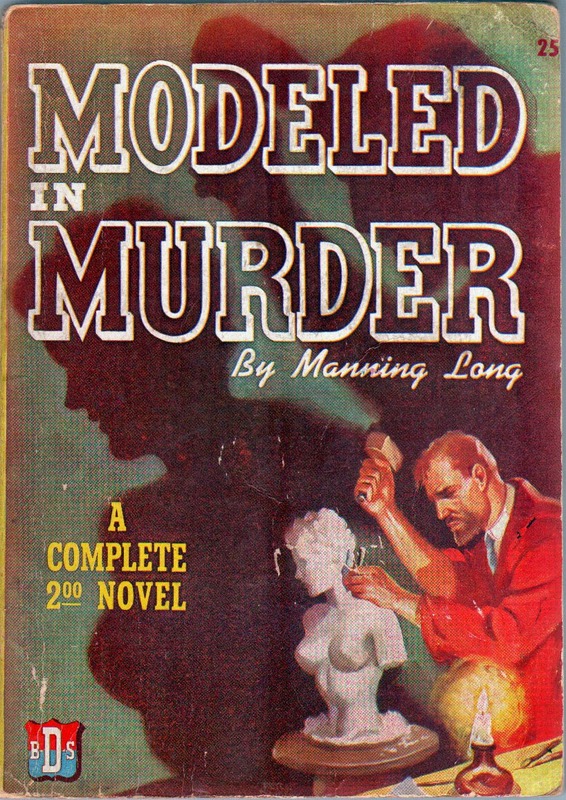 8: "Modeled in Murder" by Manning Long; Copyright 1943 by Margood Publishing Corporation. Martin Goodman, President. Cover art unknown. Copyright 1941 by Manning Long. Originally published under the title "Here's Blood in your Eye". An abridgment of the original. A new sub-publisher appears this release, Margood Publishing Corporation, created explicitly for this very issue and later will be used for the comic books Black Knight, Billy Buckskin, Two Gun Western, Willie Comics, Frankie Comics, My Girl Pearl, Ideal Comics and the Goodman film magazine Film Stars. "Margood" is the joining of the first 3 letters of Martin with the first 4 letters of Goodman. The BDS shield is larger and more prominent now, as well as colored red, white and blue for the war effort. No. 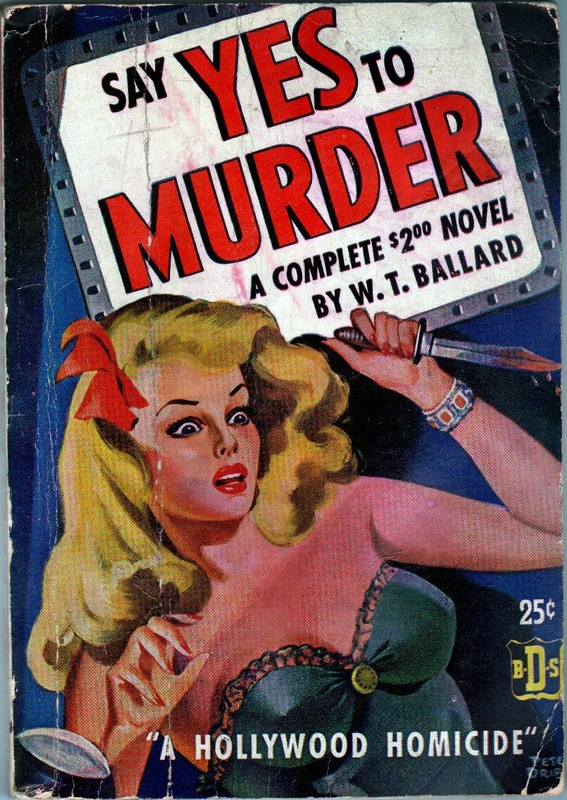 9: "Say Yes to Murder" by W.T. Ballard; Copyright 1943 by Sphere Publications, Inc., Martin Goodman , President. Peter Driben cover art. Copyright 1942 by W.T. Ballard. Another new sub-publisher, Sphere Publications, Inc., created for this particular release. Goodman will later use the company extensively in his comic book line on titles including Funny Frolics, Millie the Model, Combat Kelly, Matt Slade, Gunfighter and Kid Slade, Gunfighter. No. 10: "Murder R.F.D." by Herman Peterson; Copyright 1943 by Euclid Publishing Co., Inc., Martin Goodman, President. 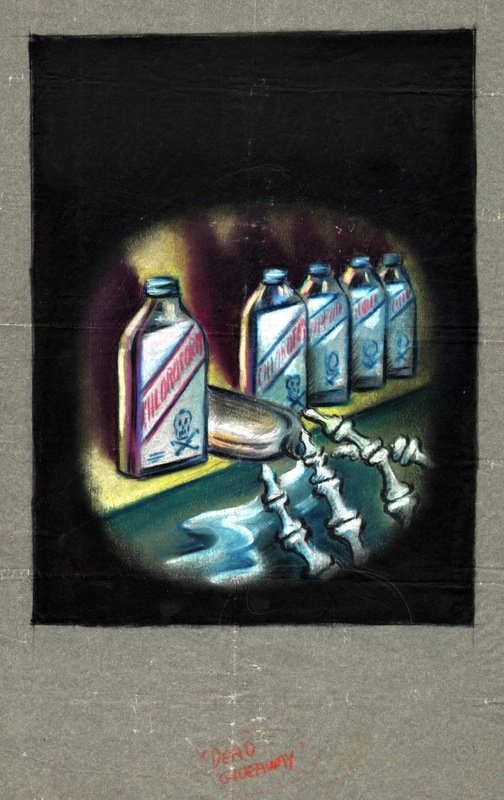 Peter Driben cover art. Copyright 1942 by Herman Peterson. An abridgment of the original. 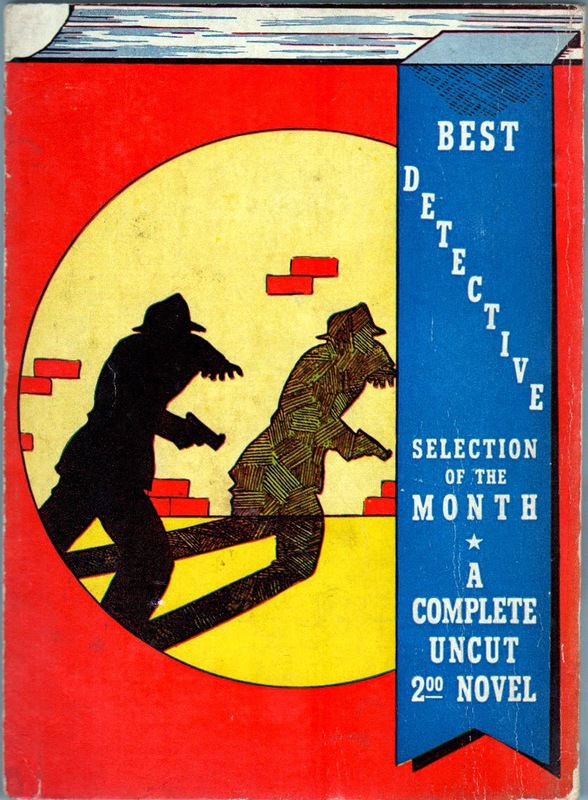 This final release in the Best Detective Selection series is unnumbered and only identified as from the series by virtue of the large BDS shield on the cover. A new sub-publishing company is established for this issue, Euclid Publishing Co., Inc., a company Goodman rarely used. In fact, it was only used 5 times! 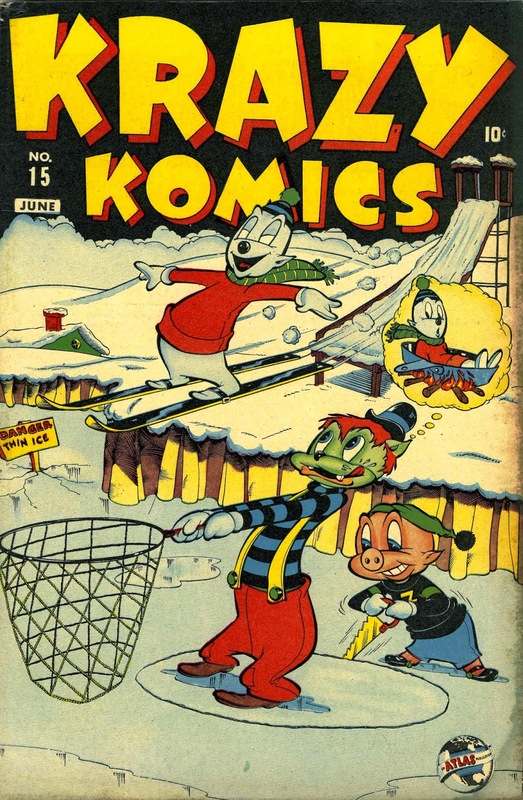 Twice on these paperback digests and on 3 single comic book issues, Amazing Comics #1 (Fall/44), Complete Comics #2 (Winter 1944-45) and Komic Kartoons #1 (Fall/45). No. 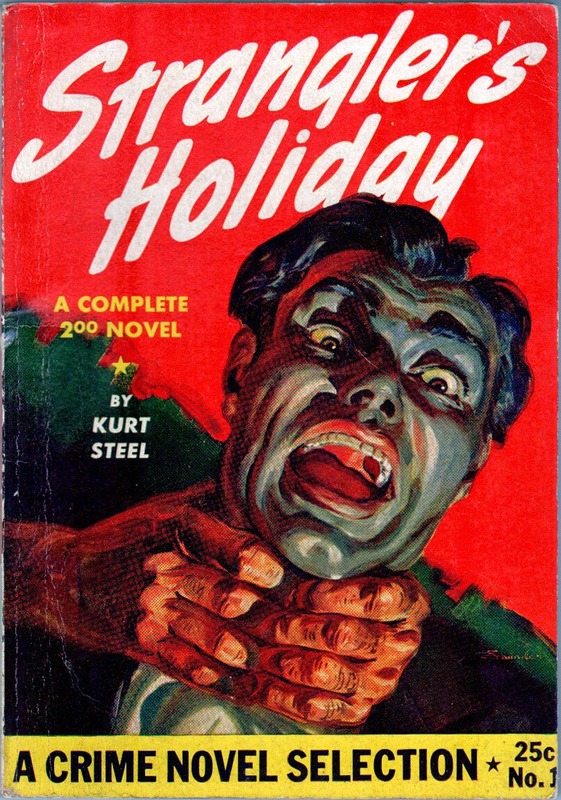 1: "Strangler's Holiday" by Kurt Steel; Copyright 1942, Select Publications's Inc., Norman Saunders cover art. (Abridgment of the original), [Original copyright 1937 by Kurt Steel, published under the title "Murder in G Sharp".] (hand stamped). Here is the Norman Saunders pen and ink original the painted cover was based on, as well as the back cover, which will be exactly the same for all 6 Crime Novel Selection releases. The hand stamped "original" copyright notice in the indicia is very important to us. This shows that Martin Goodman was forced by the Federal Trade Commission to inform his buyers/readers that the books he was publishing were in fact reprinted and re-titled books already published. Goodman was able to get 3 releases out from his Best Detective Selection series prior to this, but had to reveal it here in his Crime Novel Selection series from the very start. In the article "The Good Fight is Won". [The Pulp Reprint Evil is Whipped] by Managing Editor A.M. Mathieu in the March 1942 issue of Writer's Digest, the culmination of several years of complaints by top pulp publishers was rewarded. The recipients of this wrath were two derivative pulp houses, Martin Goodman (with Jean Goodman) and Louis H. Silberkleit (with Harold Hammond). Notable for us, in the FTC Stipulation #4725, Silberkleit and Hammond's business concern curiously operated under the title "Atlas Fiction Group, Inc."
On January 5, 1942, freelance writers won their Magna Charta. By a Federal Trade Commission Stipulation the precedent has been firmly established in two separate instances, that a magazine of reprint fiction which fails to designate plainly that it is a reprint magazine, is guilty of unfair trade competition (restraint of trade) when by its similarity it tends to take trade away from a magazine using original fiction through ambiguous representation of its contents. No two-by-four printer, with a lot of brass nerve and a basement full of paper, can buy up a flock of reprints, by hook or crook, and put them together under the title or Argus, and sell it on the newsstand next to Argosy. Especially if the printer-fox is after Argosy’s customers. Because our legal, traditional and cultural heritage is so chuck-full of a love of freedom of the press, this precedent was established only after hard, long years of work. Writers have Harry Steeger and H.L. Ralston to thank most. The Author’s League, especially the Pulp Paper Section, worked hard. The DIGEST itself was the chief organ. And. At the start, the sole organ, damning the reprint menace. All our editorials were used by the commission, as well as letters published in the DIGEST from great and near-great authors who spoke their piece against reprints. Everyone has heard of a Federal Trade Commission stipulation, but few people have seen one. Published herewith is the text of the law that kills the reprint evil. This stipulation refers only to one company; actually many firms were engaged in reprint publishing to the detriment of authors, and to publishers of original fiction. The fact that this stipulation slaps directly at one firm is not the news. The issue is simply that the precedent is now set. No one may safely publish a reprint fiction magazine, and ambiguously or inferentially, accidentally or otherwise, delude the reader into thinking he is buying first-run fiction. The actual FTC Stipulations I'll post at the end of this piece in the addendum. What I will present is the record dealing with Louis Silberkleit. The Goodman one is for the most part identical. No. 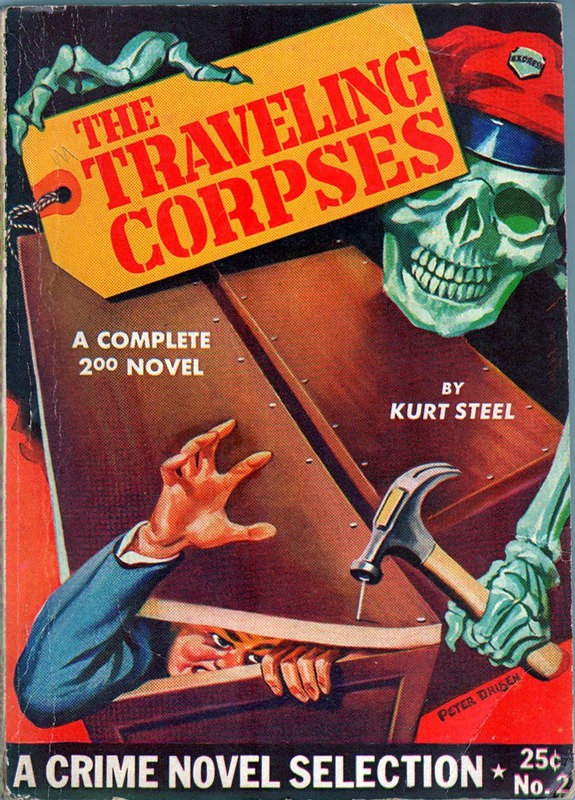 2: "The Traveling Corpses" by Kurt Steel; Copyright 1942, Select Publications, Inc., Peter Driben cover art. Copyright 1935 by Kurt Steel. 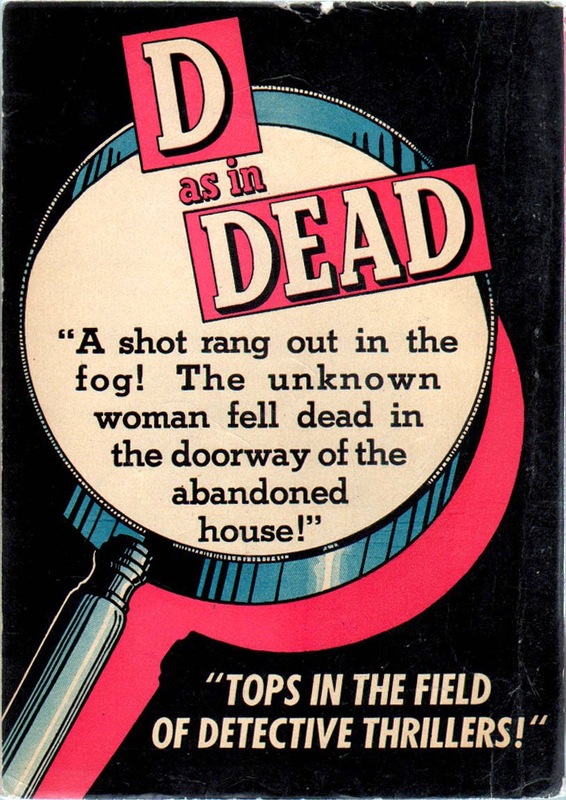 This book was originally published under the title "Murder of a Dead Man". The Peter Driben (attributed) interior with the same back cover. 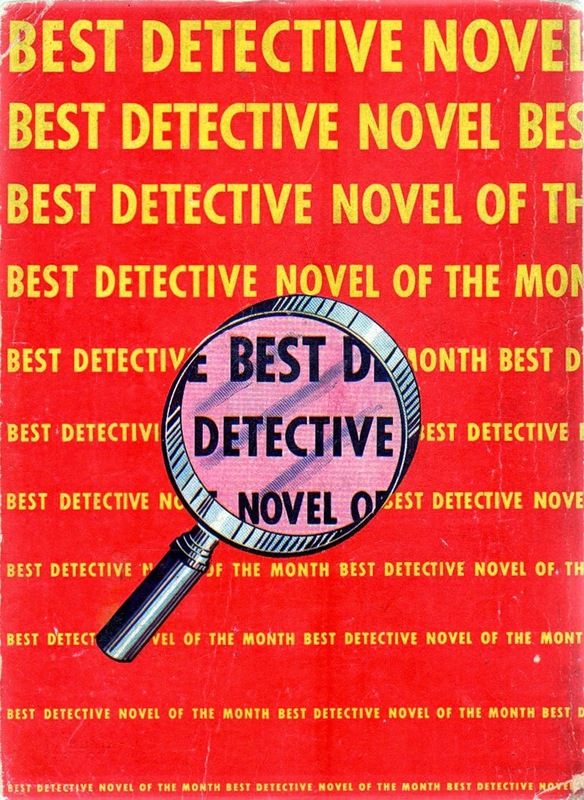 The inside back cover advertised the concurrently being published Best Detective Selection No. 5 with a new Kurtzman-esque illustration/cartoon by frequent Goodman artist George Wolfe. Wolfe was all over Goodman's humor/girly bedsheet magazines of the time and will be a voluminous contributor to his later Humorama line of digests. No. 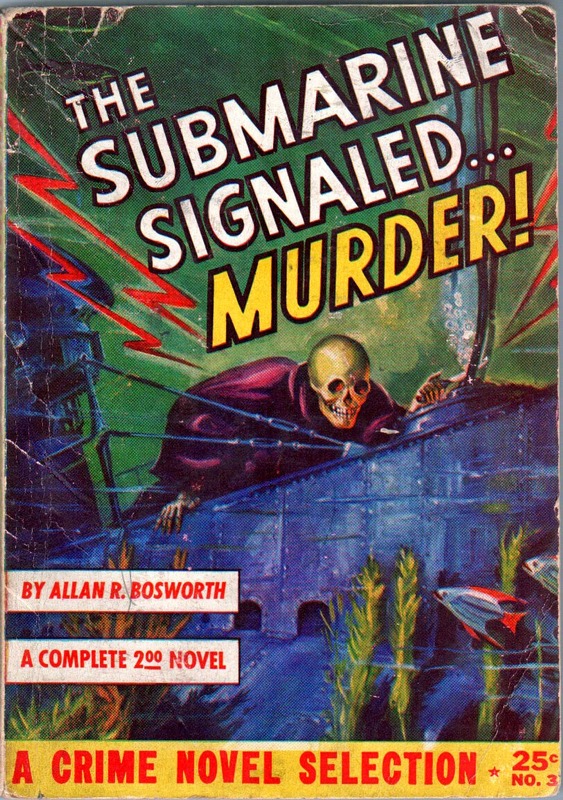 3: "The Submarine Signaled ... Murder!" by Allan R. Bosworth; Copyright 1943, Select Publications, Inc., cover art unknown. Copyright 1942 by Allan R. Bosworth. This book appeared under the title: "Full Crash Dive". An abridgment of the original. No. 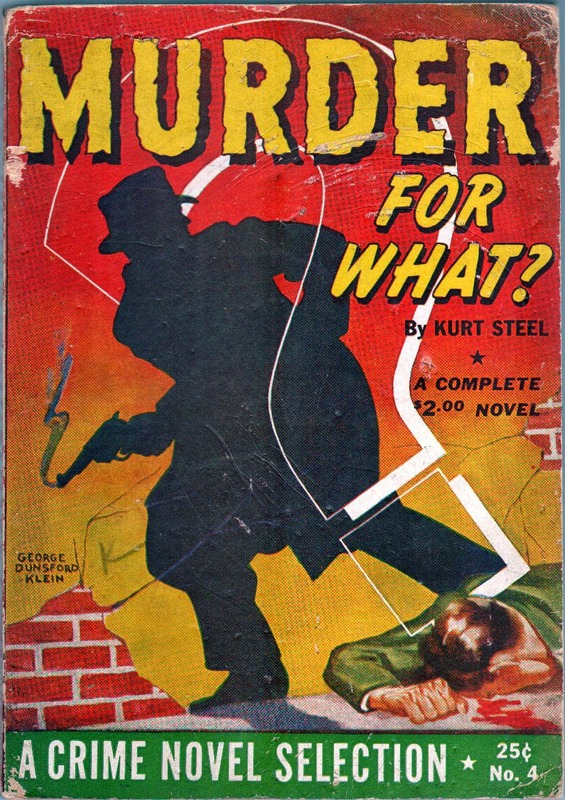 4: "Murder For What?" by Kurt Steel; Copyright 1943 by Select Publications, Inc., Martin Goodman, President. George Dunsford Klein cover art. Copyright 1936 by Kurt Steel. An abridgment of the original. Martin Goodman is identified above as the president of the sub-publisher Select Publications, Inc.
No. 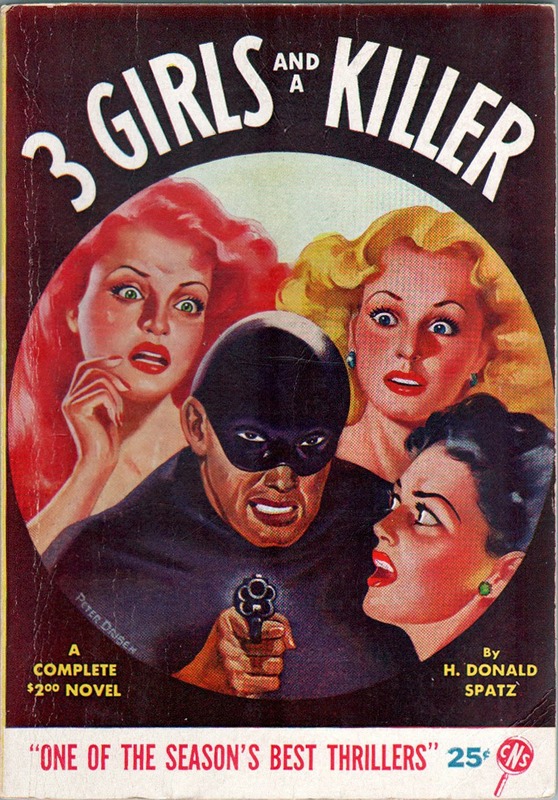 5: "3 Girls and a Killer" by H. Donald Spatz; Copyright 1943 by Red Circle Magazines, Inc., Martin Goodman President. Peter Driben cover art. Copyright 1942 by Phoenix Press. A new sub-publisher now, Red Circle Magazines, Inc., the very first time Goodman will utilize it, created expressly for this paperback crime digest and used in the comics on Comic Capers, My Romance/My Own Romance, Hedy DeVine/Hedy of Hollywood, the magazine Filmland, the Mad Magazine clone Snafu, and several of his future Red Circle/Lion Books releases. This release is not numbered anywhere as #5 except on the inside back cover of Best Detective Selection #7 (which also has no identifying numbering for itself on that release!). Note the CNS (Crime Novel Selection) magnifying glass colophon on the lower right corner of the cover. No. 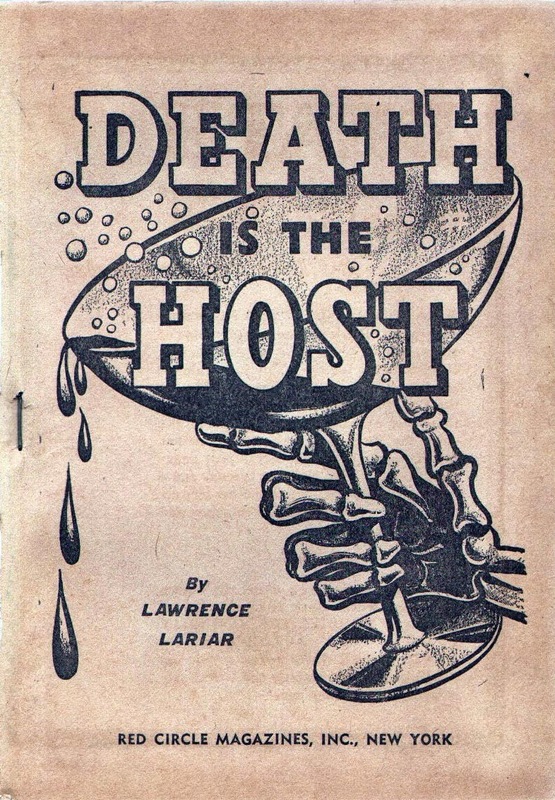 6: "Death is the Host" by Lawrence Lariar; Copyright 1943 by Red Circle Magazines, Inc., Martin Goodman, President. Cover art unknown. Copyright 1943 by Phoenix Press. Originally published as "Death Paints the Picture". Upon reaching the 10th release in the Best Detective Selection and the 6th release in the Crime Novel Selection lines, Martin Goodman does a strange thing. He completely does away with both branding banners and colophons. The next two releases will bear nothing at all identifying them other than one with the same "magnifying glass" back cover seen on the Best Detective Selection series. ??? 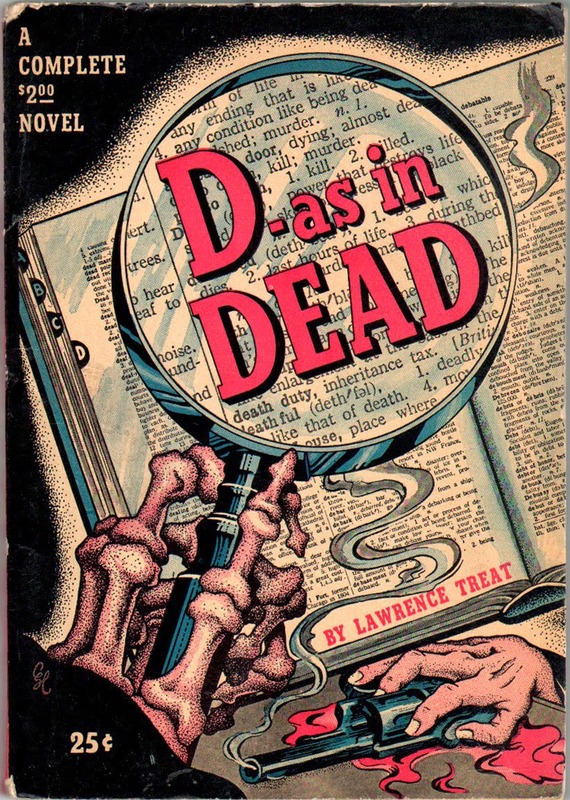 : "D-as in Dead" by Lawrewnce Treat; Copyright 1943 by Hercules Publishing Corp. Cardwell Higgins cover art. Copyright 1941 by Lawrence Treat. (An abridgment of the original). Hercules Publishing Corp. was another sub-publisher Martin Goodman created just for this release. He later got a lot of use for it in his comic books from 1945 to 1960, on titles including Daring Comics, Rusty Comics, The Kellys, Spy Cases, Menace, War Adventures, Two-Gun Kid, Tex Taylor, Ringo Kid and Melvin the Monster. 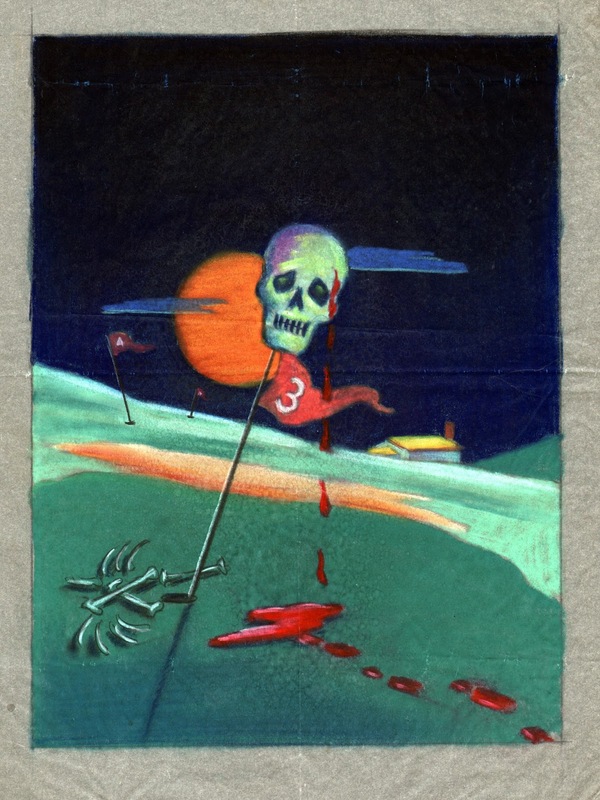 The cover artist is identified by the cursive, intertwined initals "CH" at the lower left. The back cover is the last book to sport the same "magnifying glass". The inside back cover ad is for another release that we will see. ??? 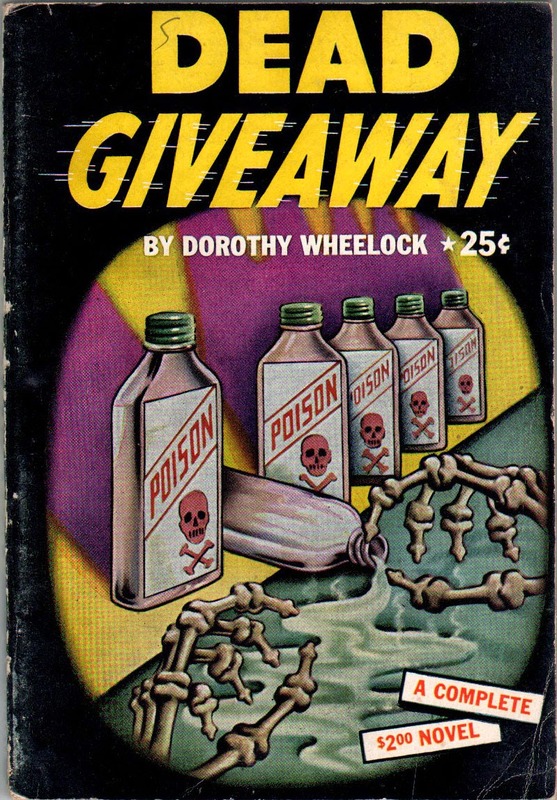 : "Dead Giveaway" by Dorothy Wheelock; Copyright 1944 by Bard Publishing Corp. Cardwell Higgins (attributed) cover art. Copyright 1942 by Phoenix Press. An abridgment of the original. This release gives us the origin of the famous and renowned Goodman sub-publisher, Bard Publishing Corporation. It debuted "here", folks. Bard would later release a ton of comic books including the entire 124 issue run of Patsy Walker, the last 10 issues of Spellbound and the first 56 issues of Sgt. Fury. Additionally, Marvin Mouse, Goodman's last pulp digest western Western Magazine, and the magazines Film Humor and TV World. The cover is unsigned but based on all the evidence, and the way the skeletal hands are rendered, it's Cardwell Higgins. After this two-issue release, Martin Goodman finally settled on a new branding of his line of paperback digests, a brand that we know extremely well. 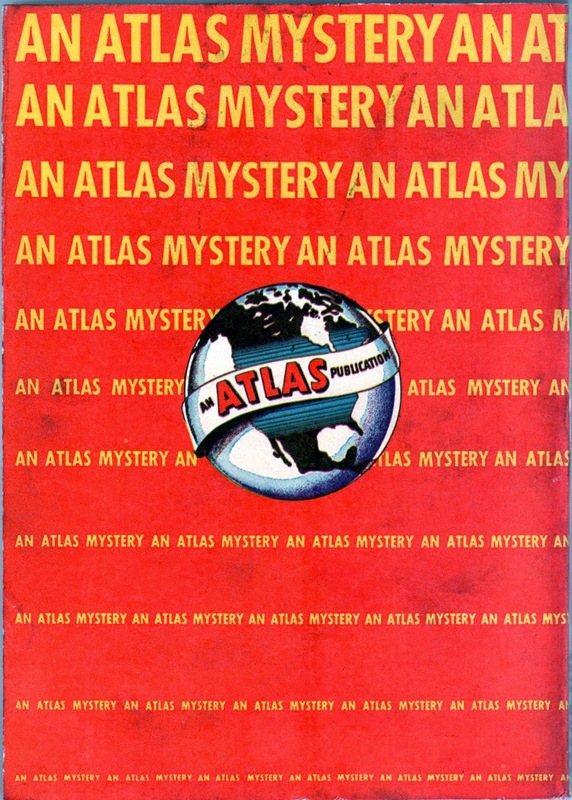 The brand was ATLAS and the line was re-christened ATLAS MYSTERY. On the very first release there appeared the Atlas globe, an icon that will be well-known 7 years hence in the 1950's as the designated name for his line of comic books and the name of his new distribution company. 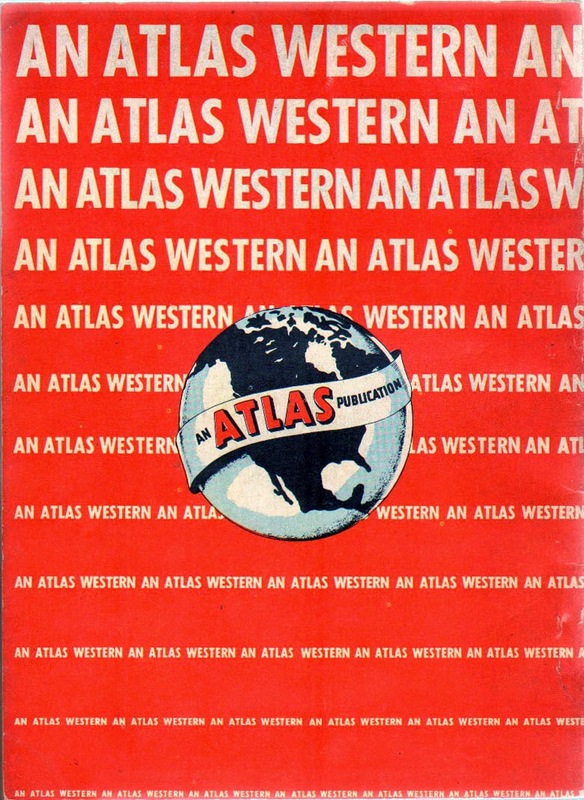 This isn't the first time Goodman used the Atlas globe on his covers. 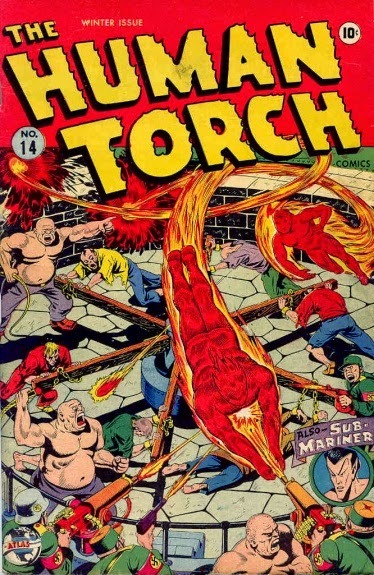 He played around with this colophon several times, first appearing on the covers of several Timely era comic books: Human Torch Comics #14 and All Winners Comics #11, both cover-dated Winter 1943-44, Terrytoons #17 (Feb/44), Comedy Comics #22 (Mar/44) and Krazy Komics #15 (June/44). It also mysteriously appears on the cover of his true-crime magazine Amazing Detective Cases Vol 4, #2 (April/44). 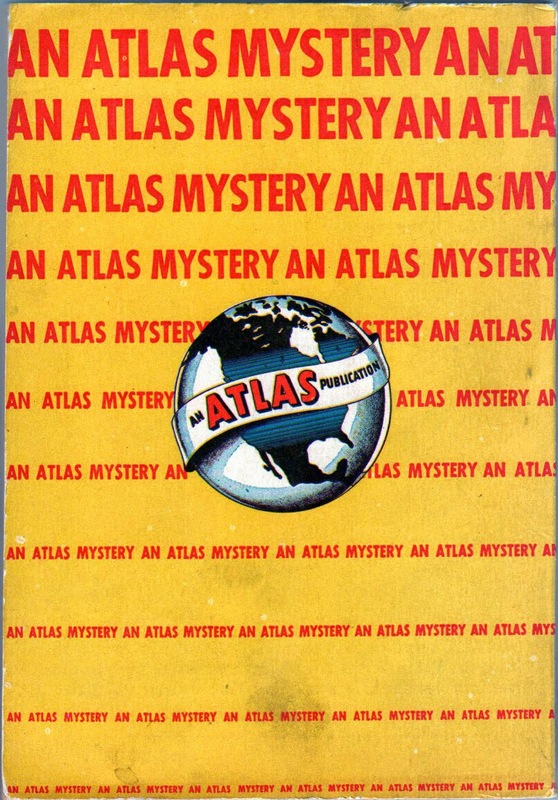 So right around the time Martin Goodman was fiddling around with the Atlas globe, testing it out on various comic book covers and a true crime magazine, he decided to go all out and rename his paperback digest line Atlas Mystery. Martin Goodman and Louis Silberkleit played a trade-off game together for decades after their break-up. Silberkleit's line in the early 1940's, among advertisers, was known as the "Atlas Fiction Group". By late 1943, Martin Goodman had hijacked the name for the handful of comics and one magazine I showed above, as well as this Atlas Mystery paperback digest line. Of course he will later start his own Atlas Distribution Company and use Atlas as both a brand on his comic books and as a distributor. In the 1970's he even started a new Atlas Comics line to compete with Marvel! Additionally, Goodman's 1930's pulp line was called Red Circle. 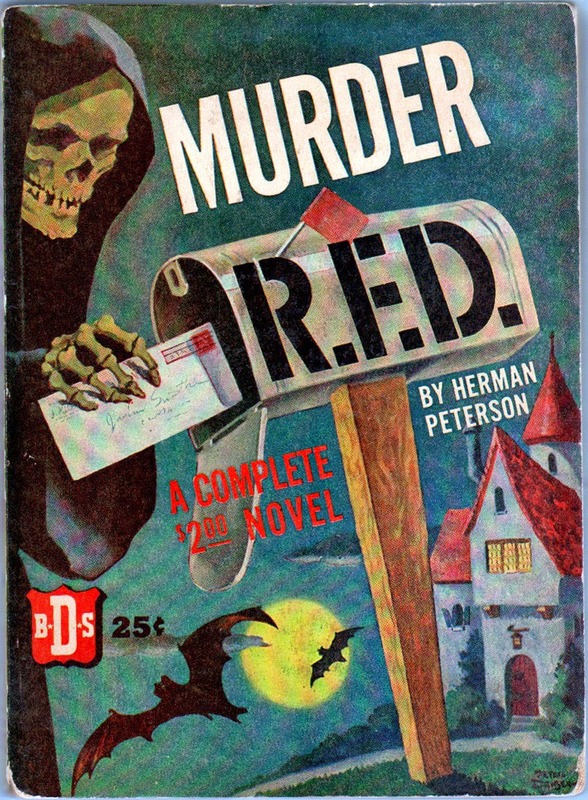 At the the same time this once vaunted pulp line was fading, he created a sub-publisher Red Circle Magazines, Inc. for his 5th Crime Novel Selection crime paperback digest (seen above), a slew of comic books and magazines, and later even launched his Lion Books line by originally calling it Red Circle Books in 1949. In later years, Louis Silberkleit put out a Red Circle line of comic books! How this swap occurred between these two friends, former partners and rivals, completely eludes me. The Atlas Mystery releases to come are not numbered. I've put them together by virtue of the "next issue" ads on the inside back covers and some obscure copyright dates I've found that I'm not certain are 100% correct. 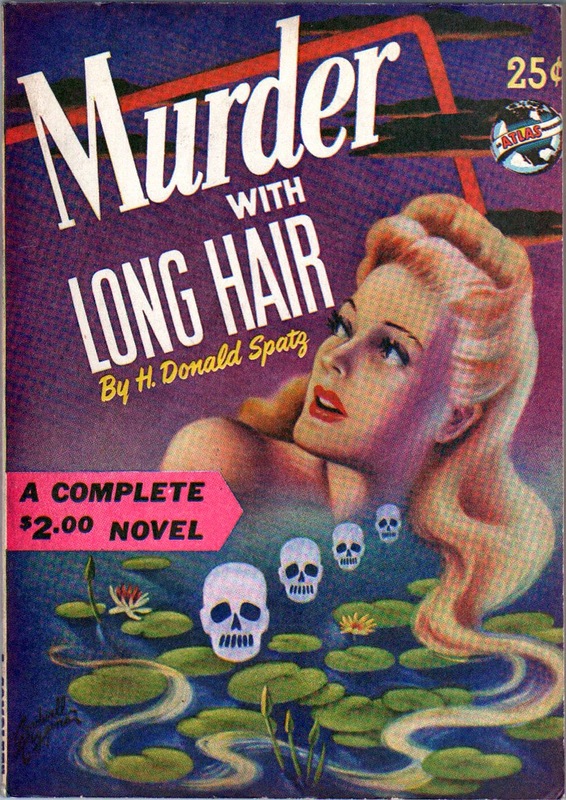 "Murder With Long Hair" by H. Donald Spatz; Copyright 1944 by Zenith Publishing Corporation. Cardwell Higgins cover art. Copyright 1940 by Phoenix Press. An abridgment of the original. 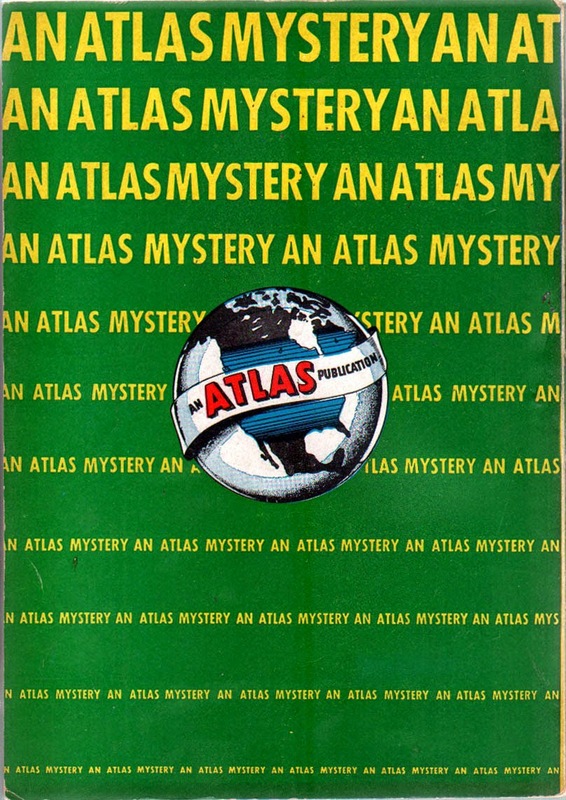 The first Atlas Mystery release will be the "only" one to sport an Atlas globe on the front cover. They "all" will display a large globe on the back cover. Zenith Publishing Corporation was created for this release. Goodman will use the company extensively in the 1950's for comic book titles including My Own Romance/Teen-Age Romance, Love Tales, Girls Confessions, Kathy, Krazy Krow, Strange Tales, World of Fantasy and Tales to Astonish. 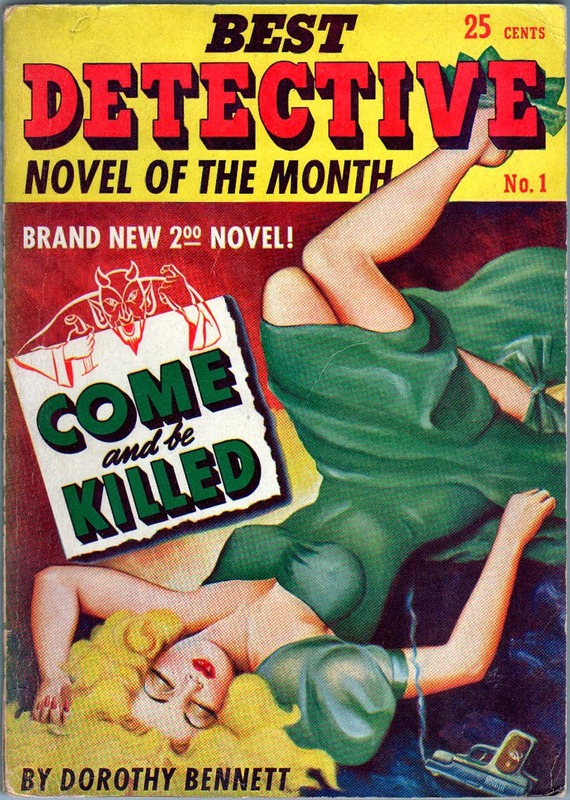 In the magazine line, the true-crime detective magazine Leading Detective Cases, Complete Police Cases, the men's magazine Men, Picture Life, the humor digest Cartoon Comedy and the pulp 2 Daring Love Novels. Goodman would later use Zenith Books Inc. to publish Dr. Strange and Fantasy Masterpieces, taken from his very last paperback line Zenith Books, which ran from 1958 to 1960. 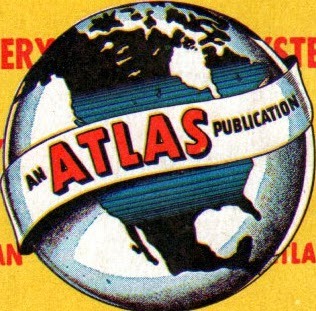 Even more spectacular than the cover, a super large Atlas globe appeared on the back cover along with an infinite scrolling list of the line's name "An Atlas Mystery". There was no denying that Goodman was going to run with the "Atlas" name and brand. "H as in Hangman" by Lawrence Treat; Copyright 1944 by Cornell Publishing Corporation. Cardwell Higgins cover art. Copyright 1942 by Lawrence Treat. An abridgment of the original. Created expressly for this release, Cornell Publishing Corporation would later be used for Girl Comics/Girl Confessions, Justice Comics #20-23, Crime Fighters #11-13, Crime Cases, Speed Carter Spaceman, Rawhide Kid, Magician Blackstone, Millie the Model #1, Junior Miss #1, Human Torch #26-35, Suspense #1-10 and Little Aspirin. It was also used for the confession magazine Life Romances and select releases of individual Lion Books. 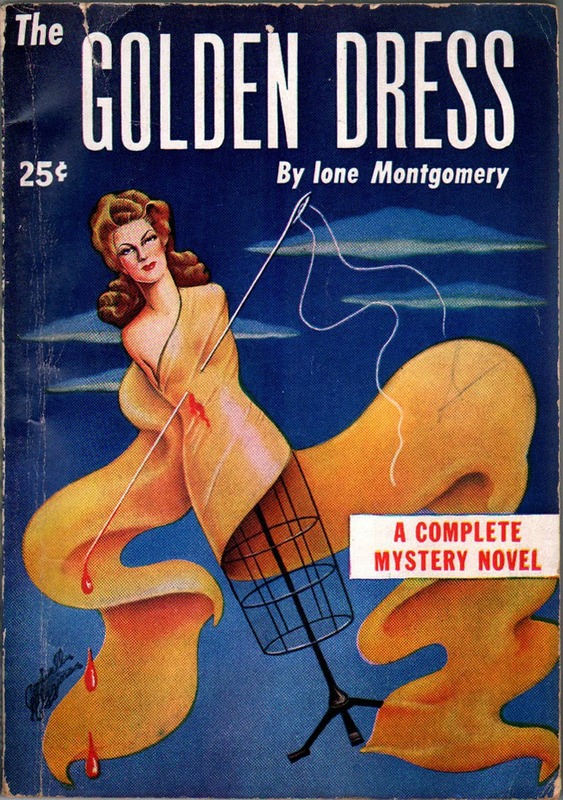 "The Golden Dress" by Ione Montgomery; Copyright 1944 by Select Publications, Inc., Cardwell Higgins cover art. Copyright 1940 by Doubleday, Doran & Co., Inc. An Abridgment of the original. 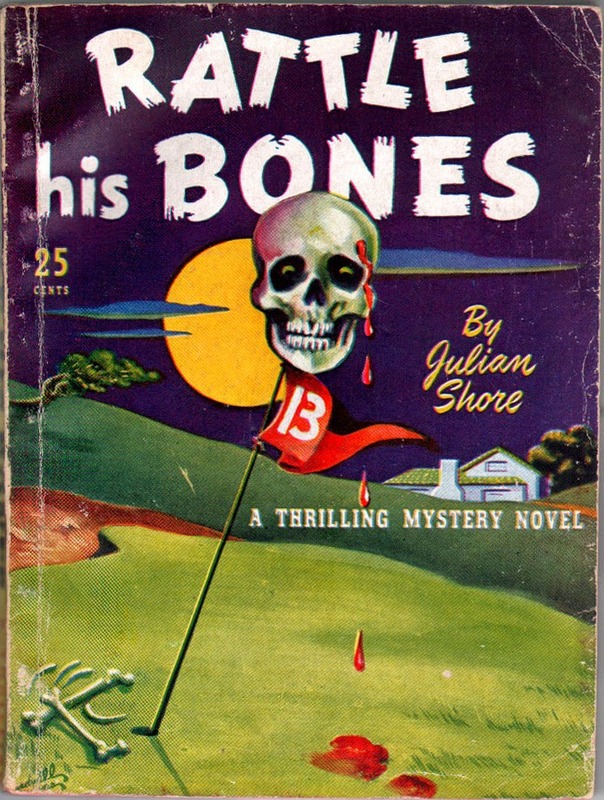 "Rattle His Bones" by Julian Shore; Copyright 1944 by London Publishing Corp. Cardwell Higgins cover art. Copyright 1941 by William Morrow and Company, Inc. An abridgment of the original. This release is the first in a smaller format, a 6 1/2" x 4 3/4" size. 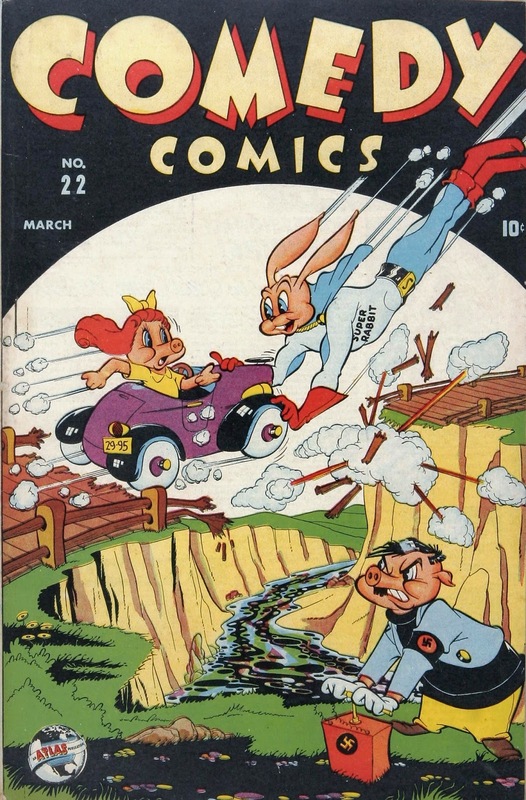 London Publishing Corp. was a new sub-publisher created for this release and used again only for 6 comic book issues, Comics For Kids #1-2 and Millie The Model #2-5. It's use was discontinued after 1947. 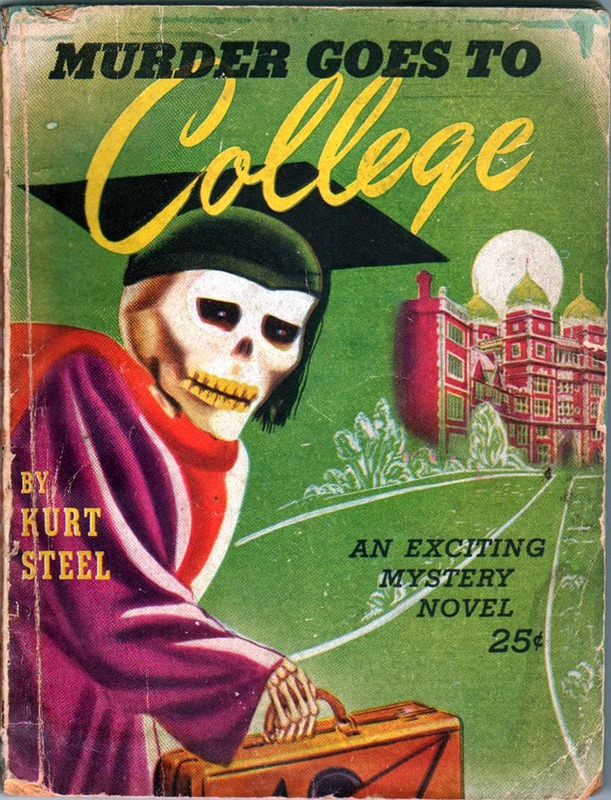 "Murder Goes to College" by Kurt Steel; Copyright 1944 by Cornell Publishing Corp. Cover art unknown. Copyright 1936 by Kurt Steel. An abridgment of the original. Published in the smaller 6 1/2" x 4 3/4" size. My guess is that this is Cardwell Higgins. I can't prove it. 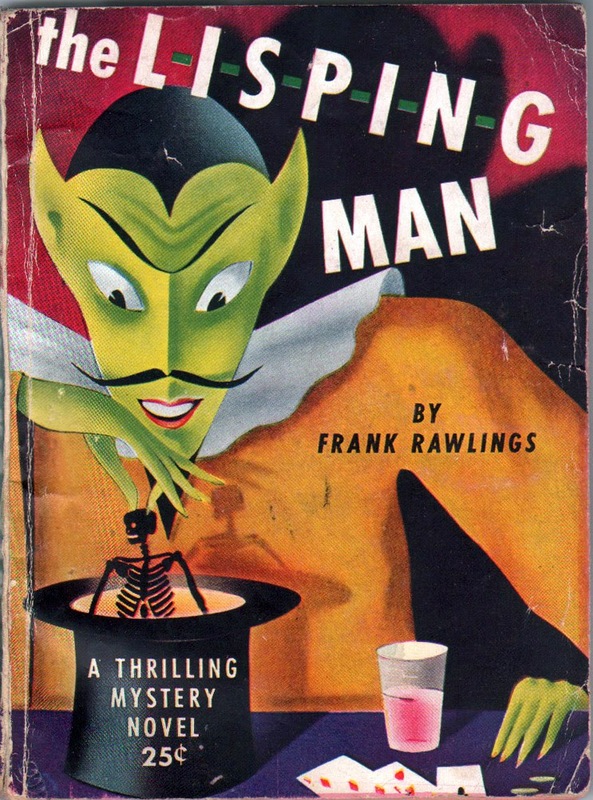 "The Lisping Man" by Frank Rawlings; Copyright 1944 by Hercules Publishing Corp. Cover art unknown. Copyright 1942 by Gateway Books. An Abridgment of the original. Published in the smaller 6 1/2" x 4 3/4" size. 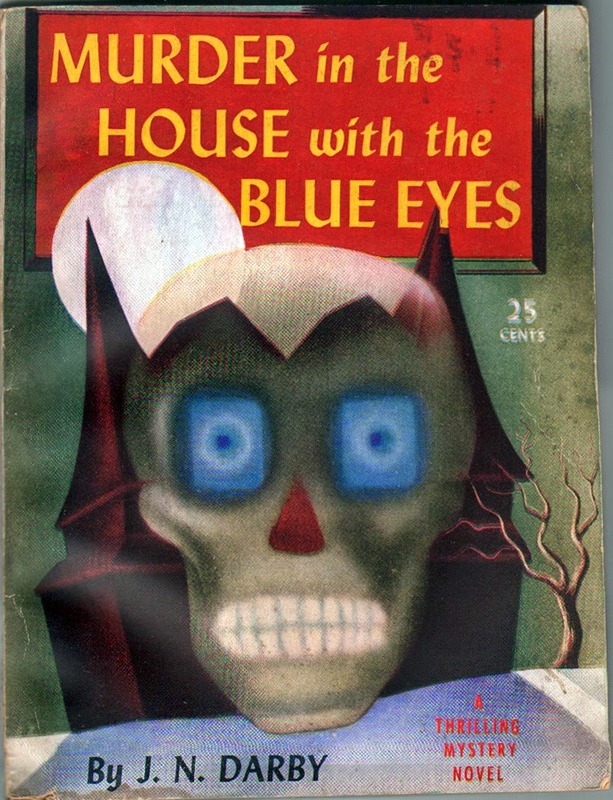 "Murder in the House With the Blue Eyes" by J.N. Darby; Copyright 1944 by Margood Publishing Corp. Cover art unknown. Copyright 1939 by The Bobbs-Merrill Company. An Abridgment of the original. 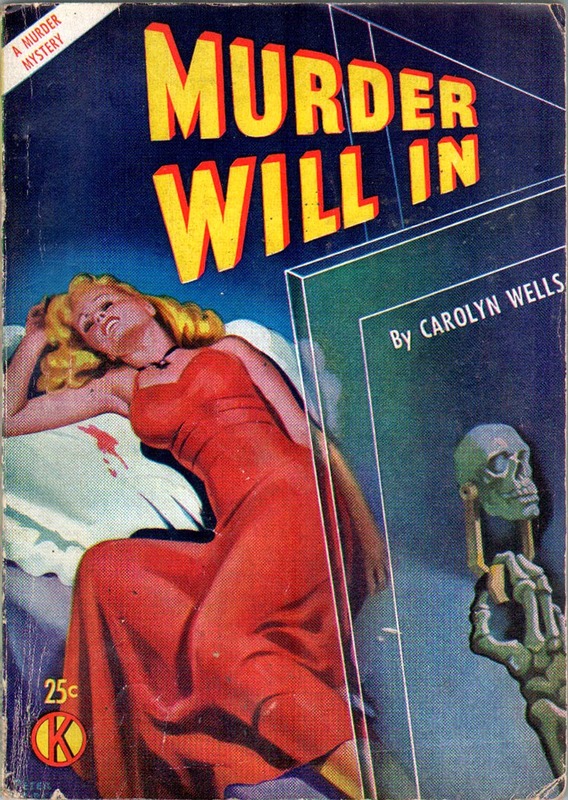 "Murder Will In" by Carolyn Wells" Copyright 1944 by Gem Publications, Inc. Peter Driben cover art. Copyright 1942 by Carolyn Wells. An abridgment of the original. Back to the standard, larger, digest size. Gem Publications, Inc. would be used several additional times by Goodman, on the comic book titles Georgie Comics, Patsy & Hedy, My Love Story, World of Mystery and the 3-issue spin-off magazine version of Miss America: Miss America Special Edition/Young Life, as well as select editions of Lion Books. 1932 was a big year for independent distributors, both good and bad. 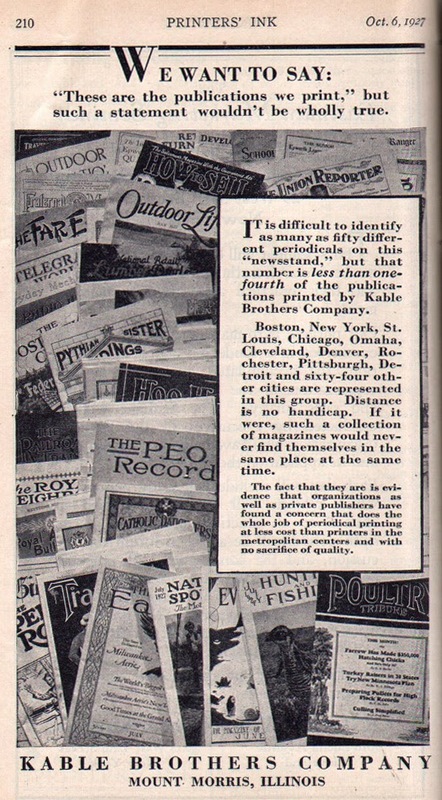 Although the country was in the midst of a crippling depression, Kable Printing Company (aka Kable Brothers Company) was flush enough so that in April of 1932 it spun off a new company to handle magazine and periodical distribution, Kable News Company. Its first client was Hugo Gernsback's Radio-Craft. 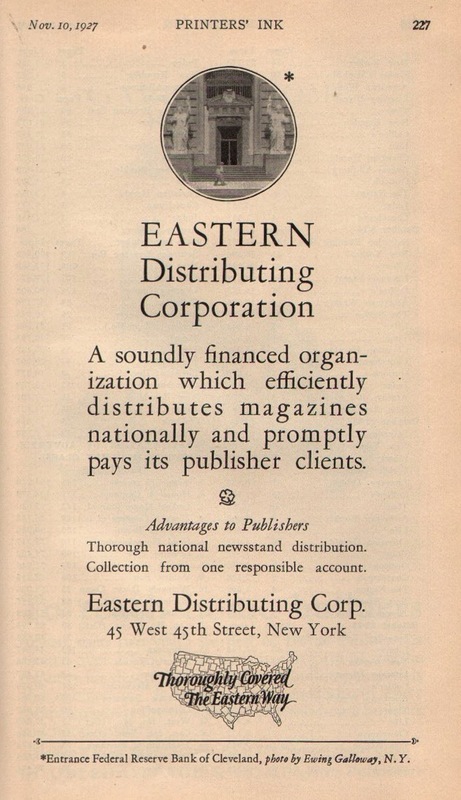 The Eastern Distributing Corporation had been formed in 1924 by Paul Sampliner and Charles Dreyfus. By October of 1932 it went under, giving rise to two more small independent distribution companies as Louis Silberkleit and Martin Goodman (both formerly of Eastern) formed Mutual Magazine Distributors, Inc., while Paul Sampliner and Harry Donenfeld (whose family, like Kable, also had a printing company, the Donny Press) formed Independent News. These two Printers' Ink advertisements from October 13 and November 10 1927, show the regional strength of Eastern as a magazine distributor. Silberkleit and Goodman spun Newsstand Publications, Inc. off the Mutual partnership and eventually ran into financial trouble. Mutual closed down in 1934 and Silberkleit left to form Winford Publications, Inc. and several other sub-publishers culminating in Columbia Publications and M.L.J/Archie. Goodman took over Newsstand, first in association with Lincoln Hoffman, then solo, as Hoffman split away to publish his own pulps under Lincoln Hoffman Publications and Ranger Publications. Goodman then formed Western Fiction Publishing Co., Inc. and was on his own forever after. The July 14, 1932 Printers' Ink ad below was run shortly after the Kable News Company formed. 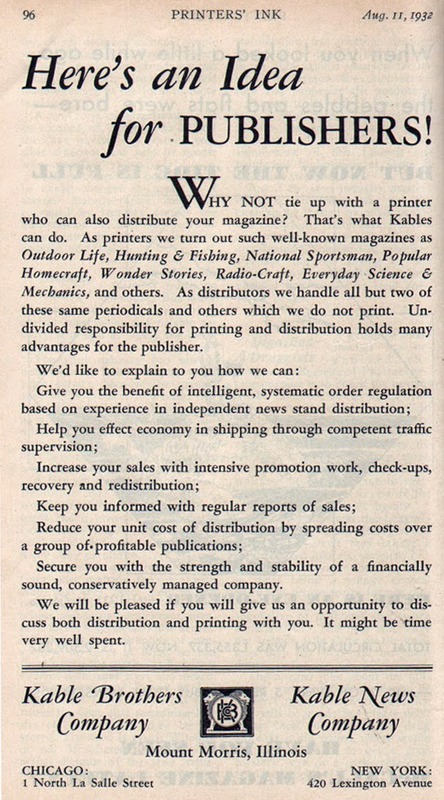 And this August 11, 1932 Printers' Ink ad offers publisher the Kable services for both printing and distribution. 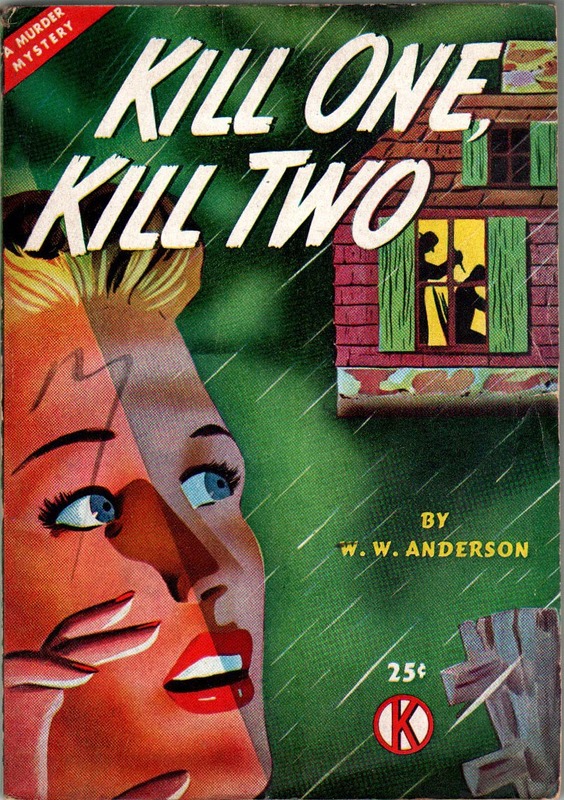 Kable eventually built itself up into a formidable distribution powerhouse and is today known as Kable Media Services, Inc.
"Kill One, Kill Two" by W.W. Anderson; Copyright 1944 by Mohawk Publishing Corp. Cover art unknown. Copyright 1940 by William Morrow & Company, Inc. An abridgment of the original. Larger size with large "K" distribution mark. The Mohawk Publishing Company was created for this release and as far as I can see, was never used again for anything. The next four all seem to have the same copyright date, making me believe the data is wrong. 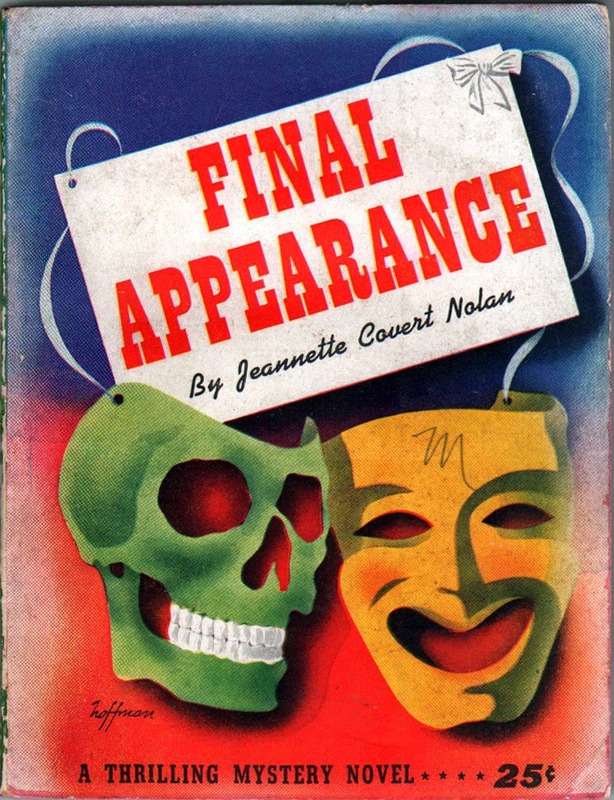 "Final Appearance" by Jeannette Covert Nolan; Copyright 1944 by Sphere Publications, Inc. Hoffman cover art. Copyright 1943 by Jeannette Covert Nolan. Again, one of the smaller sized digests. This entry does not have a Kable distribution mark, making me think it belongs earlier in the release time. I don't know who the cover artist "Hoffman" is. 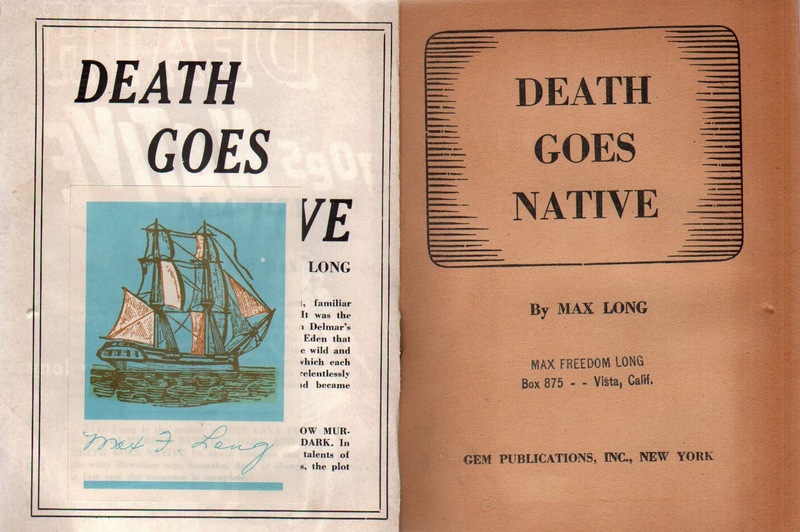 "Death Goes Native" by Max Long; Copyright 1944 by Gem Publications, Inc. Cover art unknown. 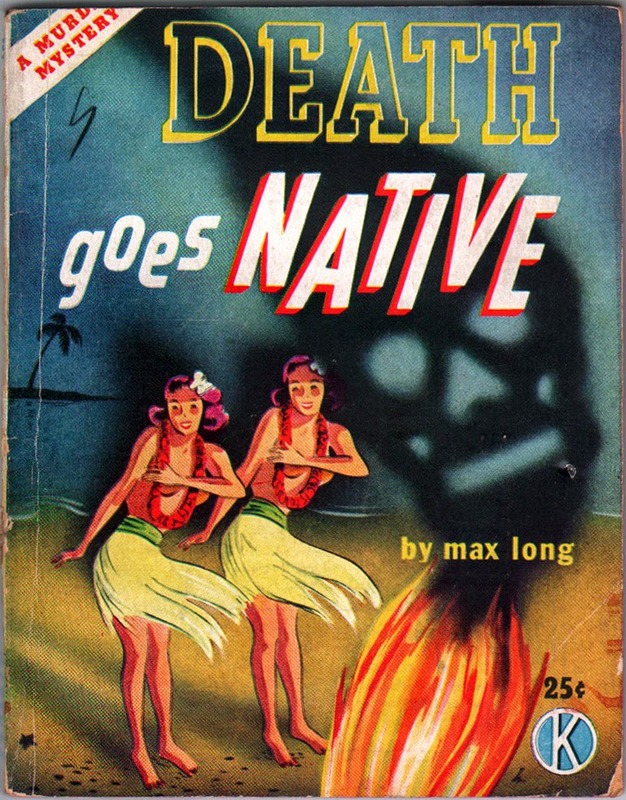 Copyright 1941 by Max Long. An abridgment of the original. Another smaller digest with a Kable mark. The way the upper left corner words are cut off it almost looks as if the top of the book was trimmed. I'm betting it was. My copy was author Max Long's copy. His signed bookplate is inside as well as his stamped address. "Hush Gabriel!" 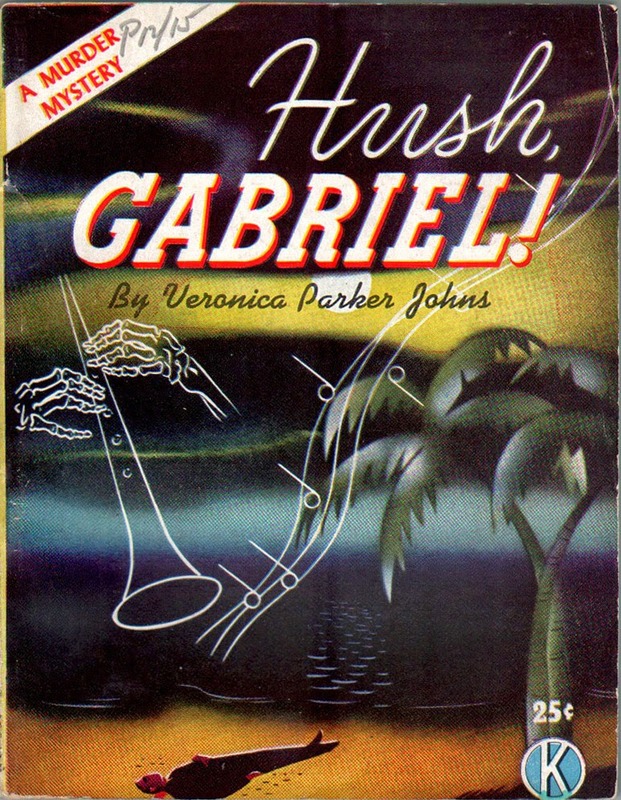 by Veronica Parker Johns; Copyright 1944 by Euclid Publishing Co., Inc. Cover art unknown. Copyright 1940 by Veronica Parker Johns. An abridgment of the original. 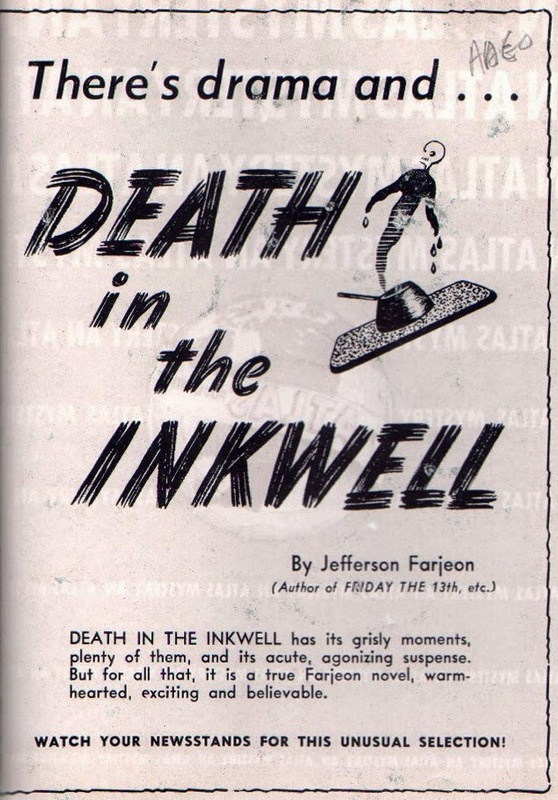 A smaller sized digest with a Kable stamp, the inside back cover ad for "Death in the Inkwell" by Jefferson Farjeon never appeared in this series. Inside back cover ad for the only title that never appeared. 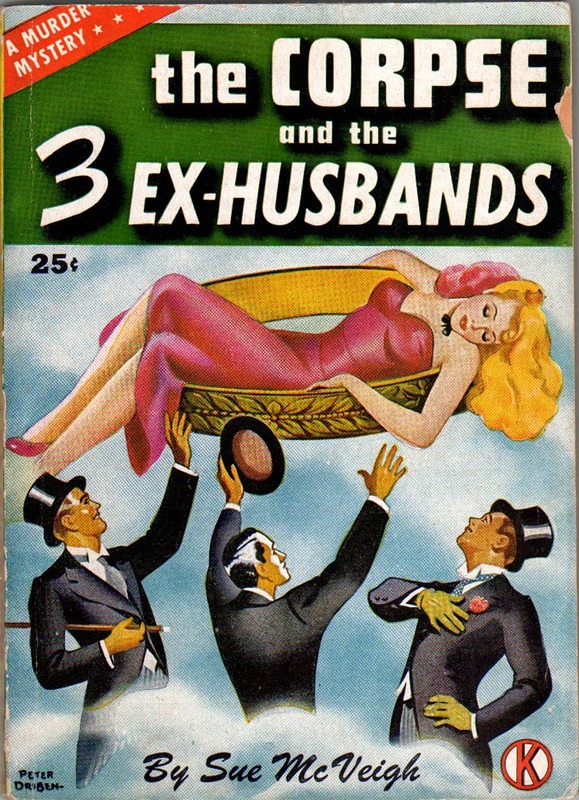 "The Corpse and the 3 Ex-Husbands" by Sue McVeigh; Copyright 1944 by Bard Publishing Corp. Peter Driben cover art. Copyright 1941 by Houghton Mifflin Company. An abridgment of the original. Back to the larger size digest and sporting a Kable stamp. 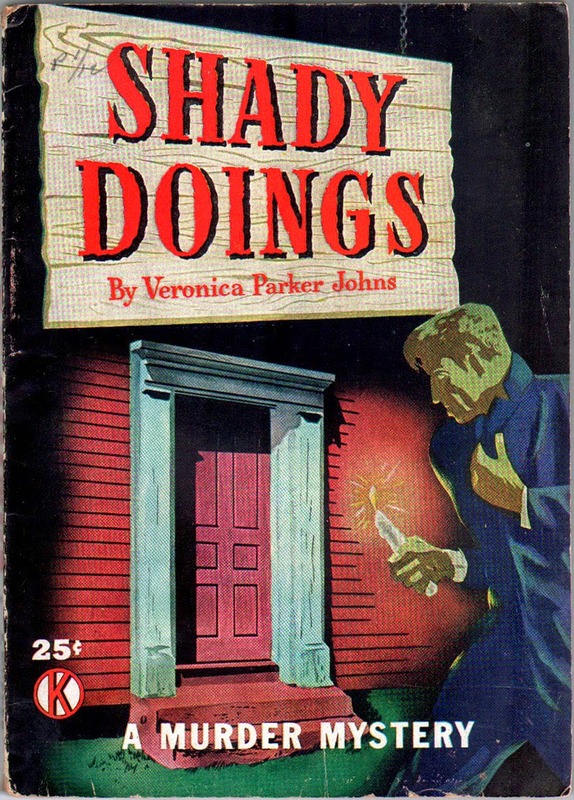 "Shady Doings" by Veronica Parker Johns; Copyright 1944 by Select Publications, Inc. Cover art unknown. Copyright 1941 by Veronica Parker Johns. An abridgment of the original. Kable distributor mark. Larger sized digest. 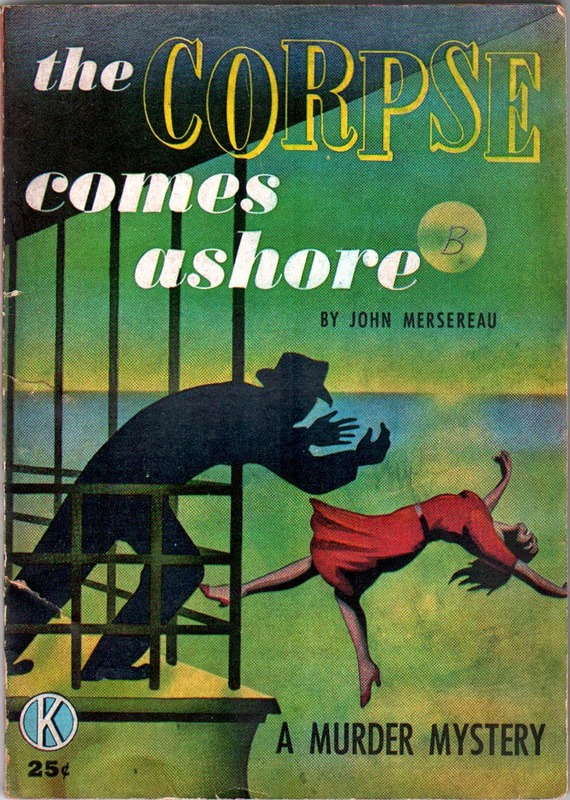 "The Corpse Comes Ashore" by John Mersereau; Copyright 1945 by Zenith Publishing Corp. Cover art unknown. Copyright 1941 by John Mersereau. An abridgment of the original. Kable stamp and large size digest. 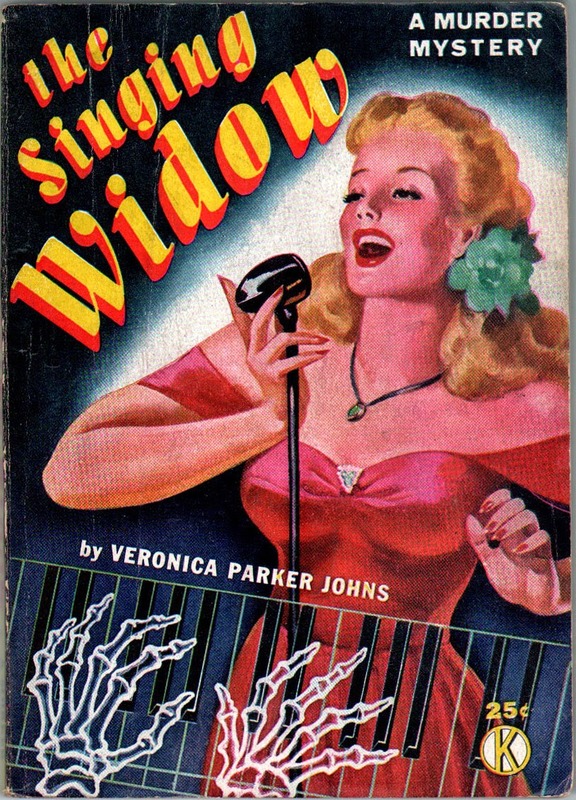 "The Singing Widow" by Veronica Parker Johns; Copyright 1945 by Bard Publishing Corp. Peter Driben (attributed) cover art. Copyright 1941 by Veronica Parker Johns. An abridgment of the original. The cover art is unsigned but I believe this is Peter Driben. Larger size with Kable stamp. 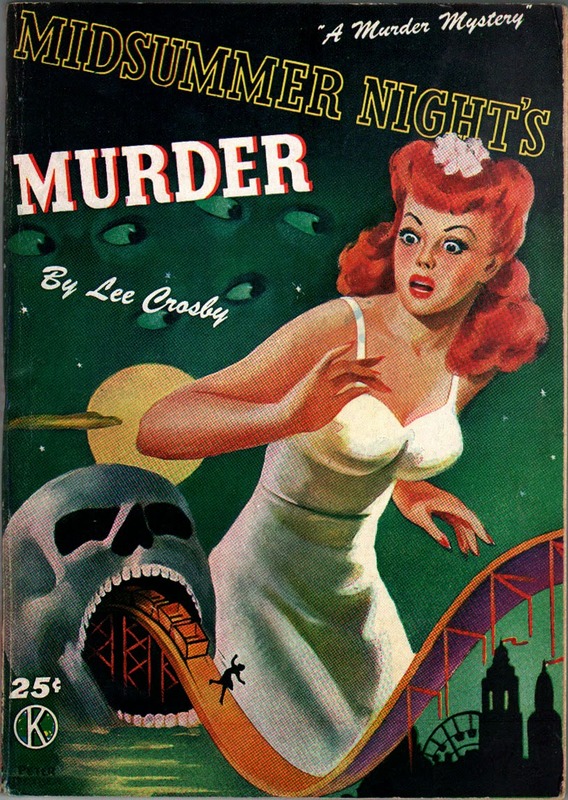 "Midsummer Night's Murder" by Lee Crosby; Copyright 1945 by Select Publications, Inc. Peter Driben cover art. Copyright 1941 by Lee Crosby. An abridgment of the original. Larger digest size with Kable distribution mark. For the first time since the series started, the inside back cover does not have a "next issue" title. 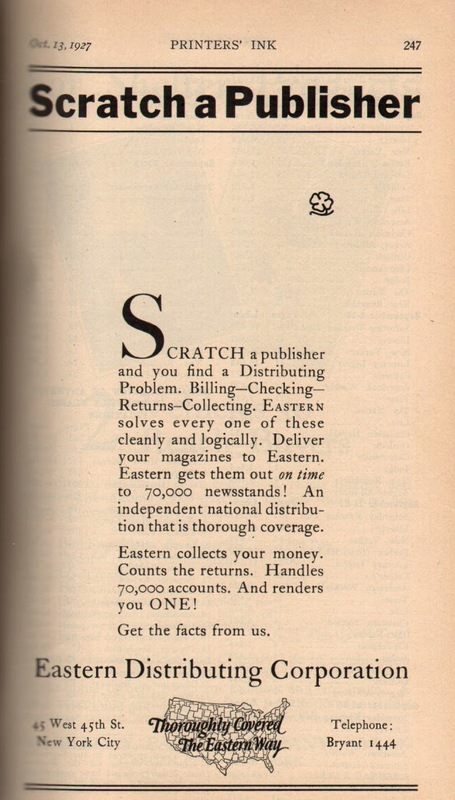 Instead is a "buy war bonds" ad supported by Select Publications, Inc.
And with this final release, Martin Goodman folded his Atlas Mystery crime paperback digest line. There were a slew of publishers who jumped on this paperback digest bandwagon. One of the small, barely-leaving-a-ripple-in-the-industry type of publishers was a company called Vital Publications. The owner/president of Vital was Julien J. Proskauer and he published out of a 148 Lafayette Street address. Proskauer was an author of minor note (The Dead Do Not Talk, 1946), a friend of Harry Houdini and one time President of the American Society of Magicians, who actively engaged in debunking mediums and exposing spiritualism frauds. 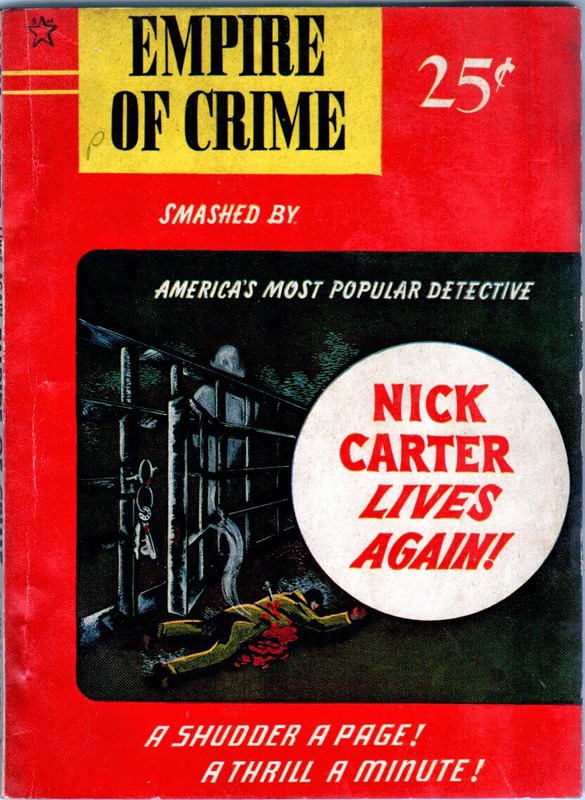 In 1945 and 1946 he published a series of 4 Nick Carter detective story digests which, according to a blurb on the inside, were ... Reprinted by special arrangement with Street & Smith Publications, Inc.
Park Avenue Murder! 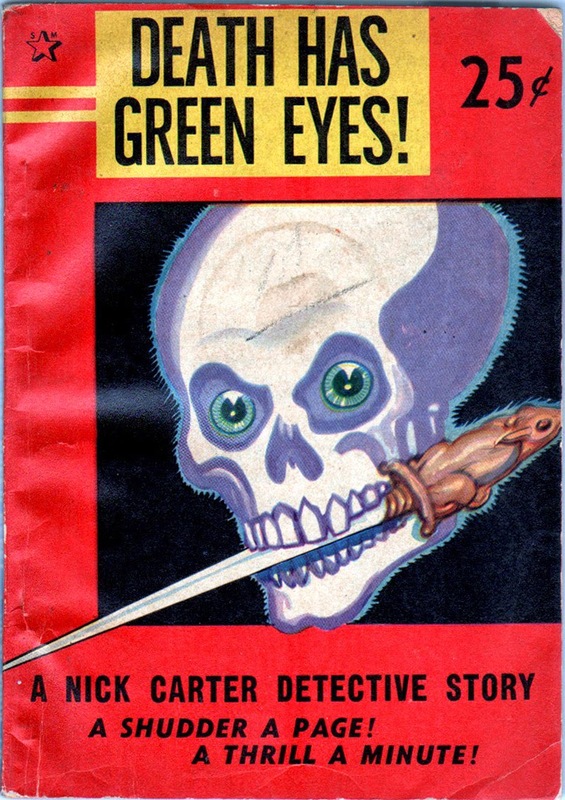 © 1946, Vital Publications, Inc.
Death Has Green Eyes! © 1946, Vital Publications, Inc.
All four were written by the pen-name "Nicholas Carter", who was really prolific pulp author Richard Wormser. And why is this important? Because of what happens next. In 1948, Martin Goodman came back with another run of Atlas Mystery digests! All five sport the Atlas globe on the cover and have the same infinity scroll "An Atlas Mystery" on the back. And one was even a western, A Western Thriller Book, with the back cover infinity scroll "An Atlas Western". Let's take a look at these five 1948 digests closely, because there is a link to Vital Publications. All 5 have a Kable distributor mark on the cover. No. 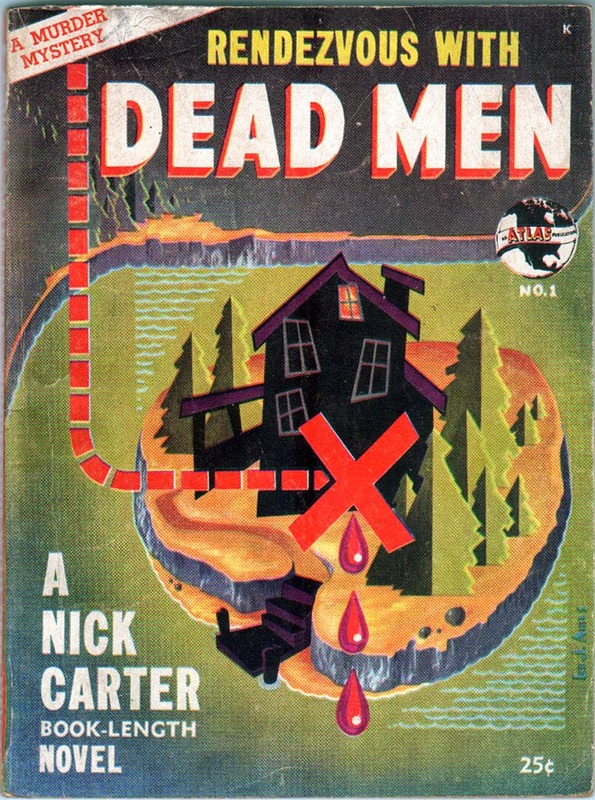 1: "Rendezvous With Dead Men" by Nicholas Carter; Copyright 1948 by Vital Publications, Inc., Reprinted with special arrangement with Street & Smith Publications, Inc. 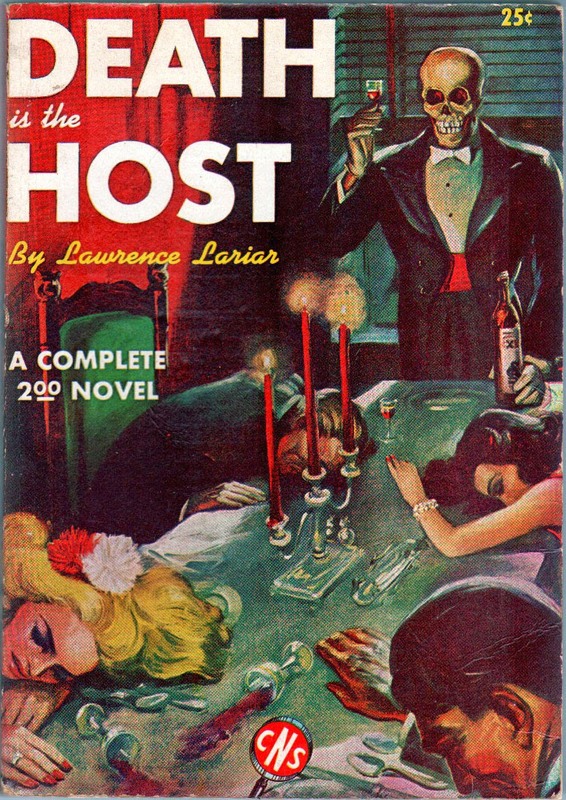 Published by Vital Publications, Inc. 148 Lafayette Street, New York, N.Y. Cover art by Lee J. Ames. 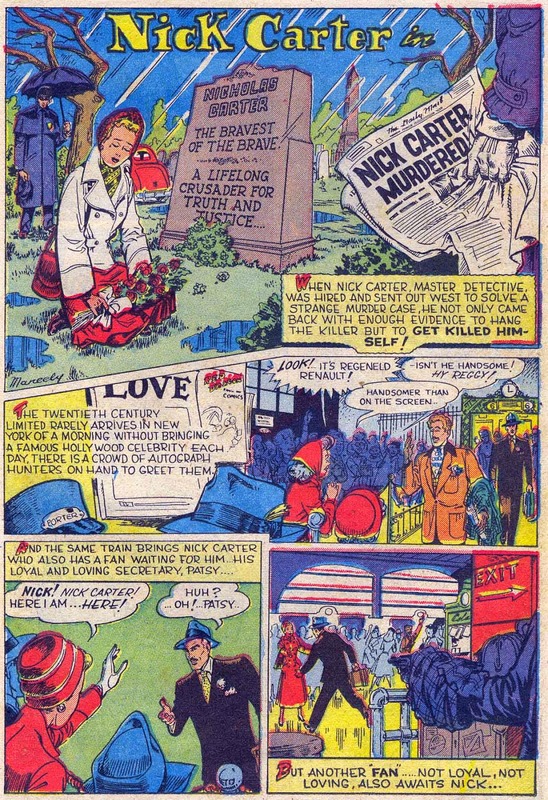 Nicholas Carter is a likely pseudonym for Richard Wormser. So what is going on here? The interior of this digest is set up exactly the same as the previous Vital digests. The publisher is Vital, it's all Vital through and through. Except the cover ... there's an Atlas globe! And the back cover ... it's "An Atlas Mystery"! No. 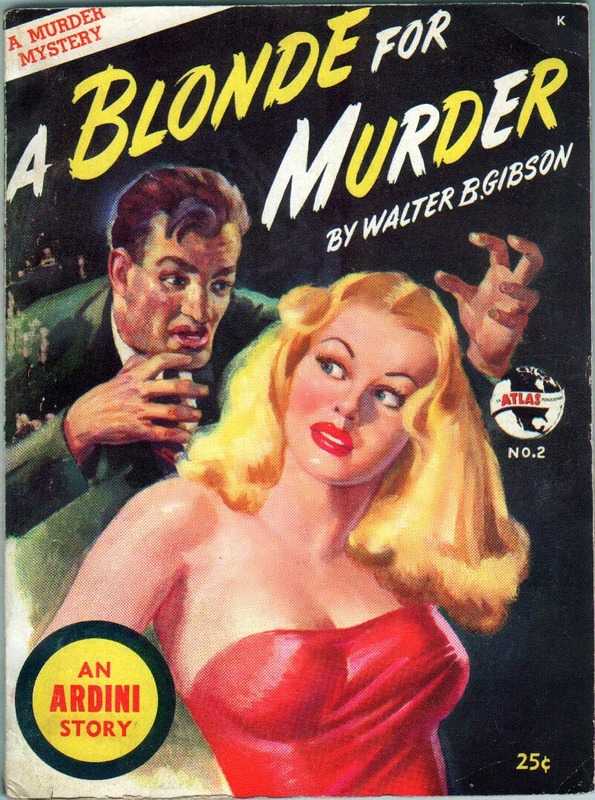 2: "A Blonde For Murder" by Walter B. Gibson; Copyright 1948 by Current Detective Stories, Inc. An original full-length novel. 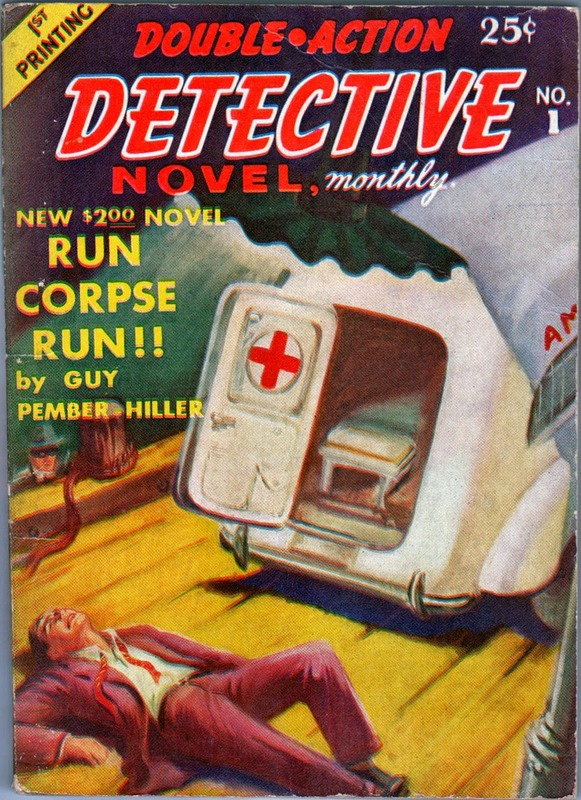 Published by Vital Publications, Inc., 148 Lafayette Street, New York, N.Y., for Current Detective Stories, Inc., 350 Fifth Avenue, New York, N.Y. Cover art Peter Driben (attributed). An Ardini mystery. An original full-length novel. Now we have more information. 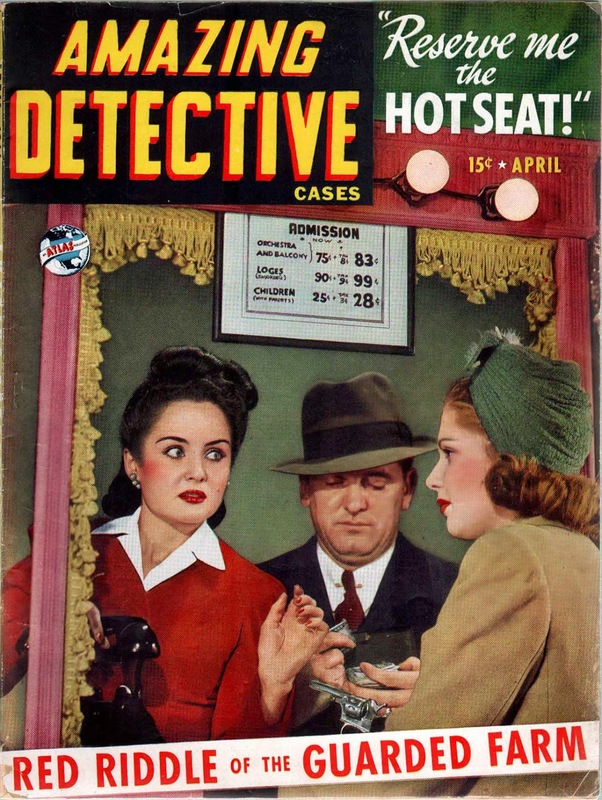 Current Detective Stories, Inc., was a Martin Goodman sub-publisher launched in late 1941 for his Exclusive Detective Cases and Expose Detective true-crime magazines. In 1943 he used it for a long run on Joker Comics #12-42, short-run humor titles Krazy Komics (2nd series), Wacky Duck, Wonder Duck, All Winners Comics (1948), All Western Winners, Black Rider, Venus #1-9, Adventures Into Terror, Romance Tales, Navy Action, Sailor Sweeney, Annie Oakley Western Tales, Six-Gun Western and the true crime magazine 10 True Crime Cases. This was not a reprint, but an original novel by Gibson about a magician detective named Ardini. The creator of "The Shadow", Gibson was a magician and had a long career at Street and Smith's pulps as well as a career as a comic book writer on nearly all their titles. He even wrote for Timely, penning their Magician Blackstone book, among others. According to the indicia, Vital was publishing it for Goodman. Except that that makes no sense, as the book has a Vital Publications layout! So why was Vital publishing this for Goodman, who already was one of the biggest publishers on the newsstands, while Vital was a "nothing"? All while sporting an Atlas Globe on the cover and "An Atlas Mystery" infinity cascade on the back cover! 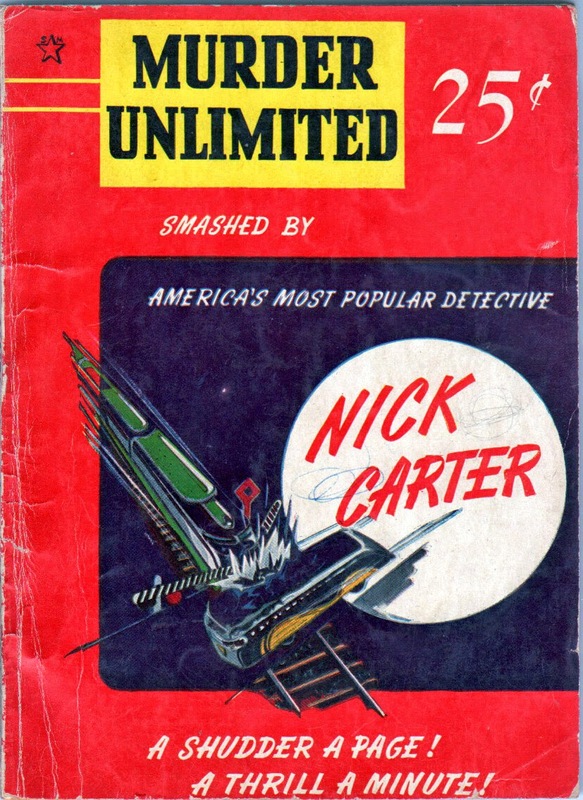 Another reprinted Street & Smith Nick Carter story written likely by Richard Wormser. Atlas globe on cover and "An Atlas Mystery" infinity cascade on the back. No. 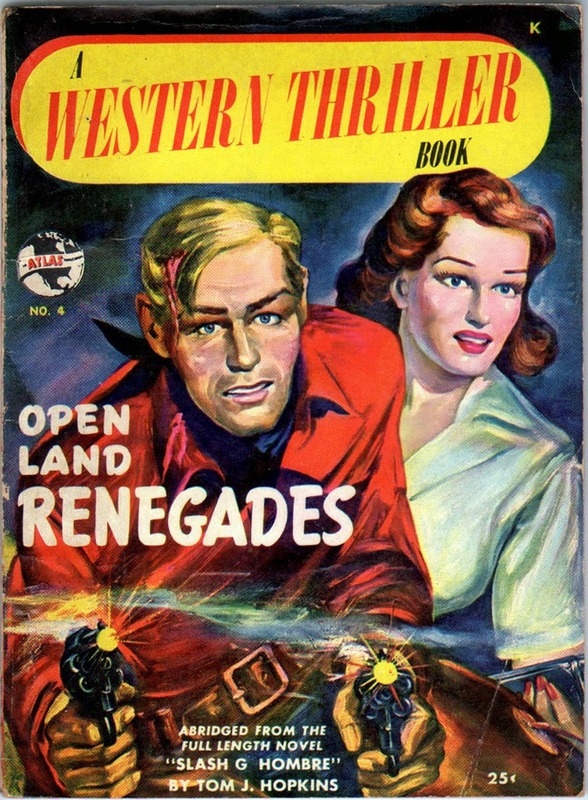 4: "Open Land Renegades" by Tom J. Hopkins; Copyright 1948 by Vital Publications, Inc. Reprinted by Special arrangement with Phoenix Press, Inc. Condensed to speed up the action from the original story published by Phoenix Press as "Slash G. Hombre". Published by Vital Publications, Inc., 148 Lafayette Street, New York, N.Y. Cover art unknown. Another Vital Publication sporting an Atlas globe. This time the back cover is an infinity scroll "An Atlas Western". This is the only western in the entire history of Goodman's 1940's paperback digest line. It looked like it wanted to become an ongoing line of western titles but instead it died on the vine. No. 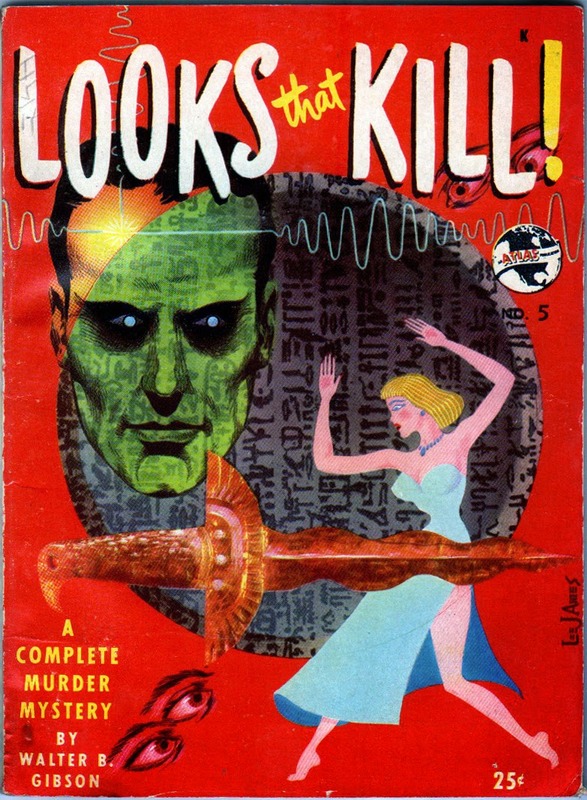 5: "Looks That Kill" by Walter B. Gibson; Copyright 1948 by Current Detective Stories, Inc. An original story. A Valdor Mystery. 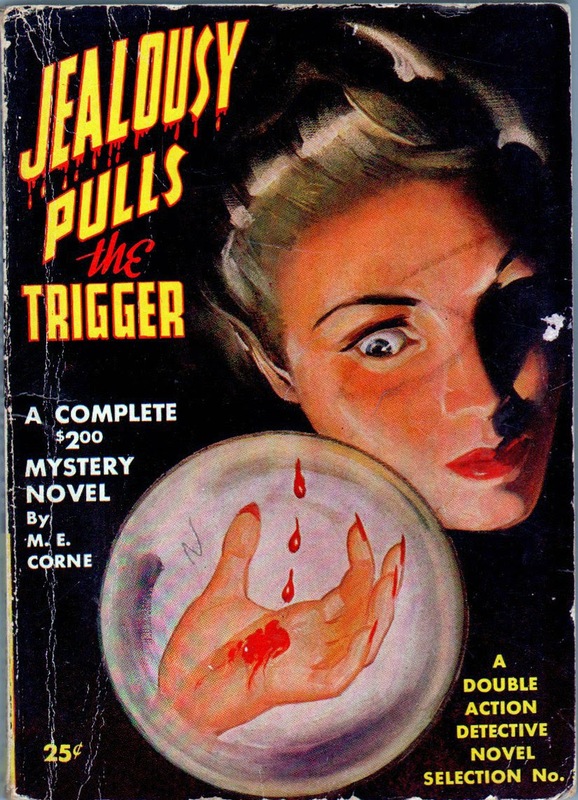 Published by Current Detective Stories, Inc., 350 Fifth Avenue, New York, N.Y. Lee J. Ames cover art. The very last Atlas Mystery is another Walter Gibson original. This time there is absolutely no mention of Vital Publications anywhere in this digest. It appears to be completely Goodman. What to make of this? It would seem that Martin Goodman and Julien J. Proskauer collaborated on these for reasons I cannot fathom at the moment. Goodman was the big publisher, Proskauer's Vital was tiny. The entire 5 issue output was laid out and printed in the manner of Proskauer's earlier 4 issue 1945-46 Vital run of Street & Smith Nick Carter reprints. 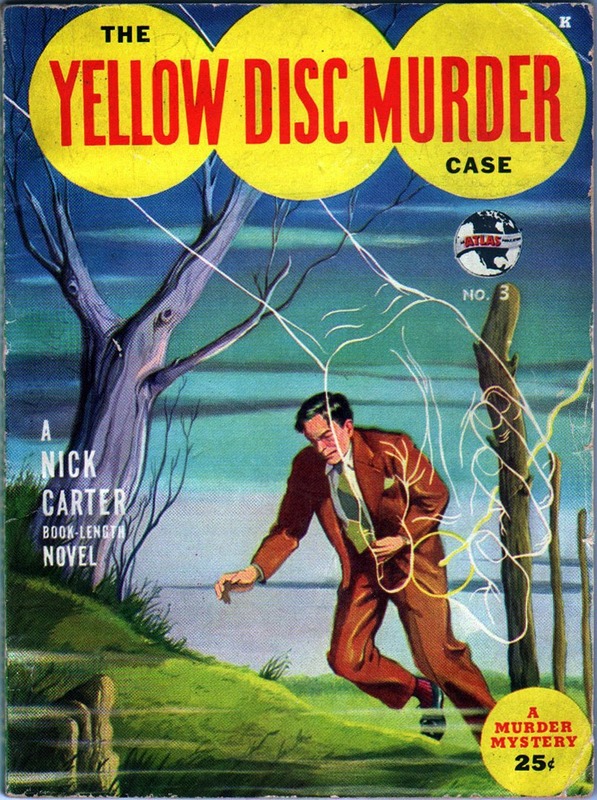 Two of the 1948 Goodman/Vital Atlas Mystery releases were also of the same nature, Nick Carter Street & Smith reprints. Two were new Walter Gibson novels (one published by Vital with Goodman, one by Goodman alone) and one western published by Vital. There is one more Goodman/Vital connection to make. 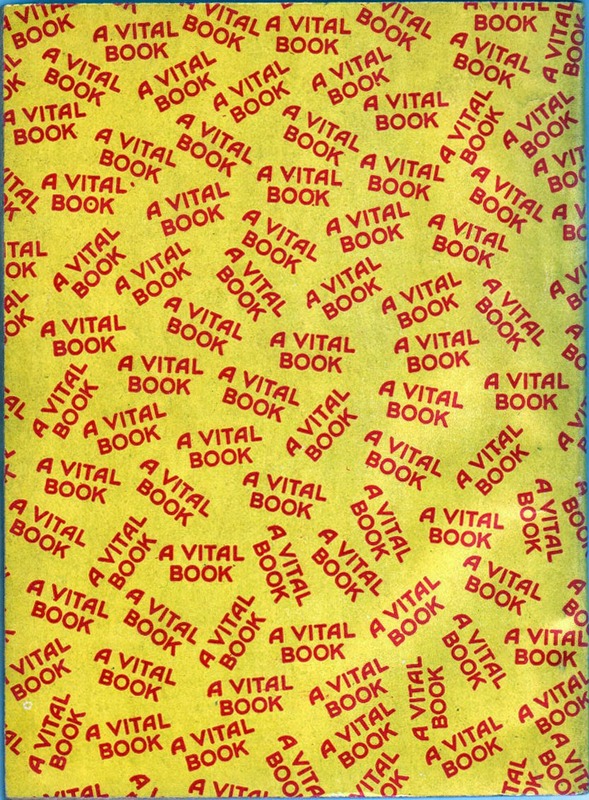 In 1949-50 Vital published a group of small, rectangular giveaway mini comic books. 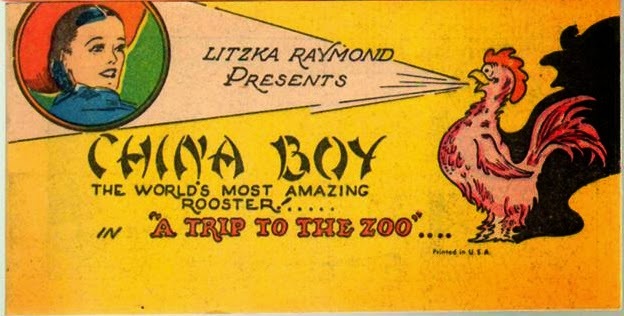 Five of them featured Timely characters, Kid Colt, Blaze Carson, Tex Taylor, Little Aspirin and Super Rabbit. The back cover on some were for Fleer "Double Bubble" penny gum. Did Vital license these characters from Goodman to publish as giveaway comics? Quite possibly. Until more information surfaces, we will have to leave it at that. The Kid Colt entry below reprinted an early Russ Heath Kid Colt story (or an edited version). All three below are copyright 1950 by Vital Publications, Inc. 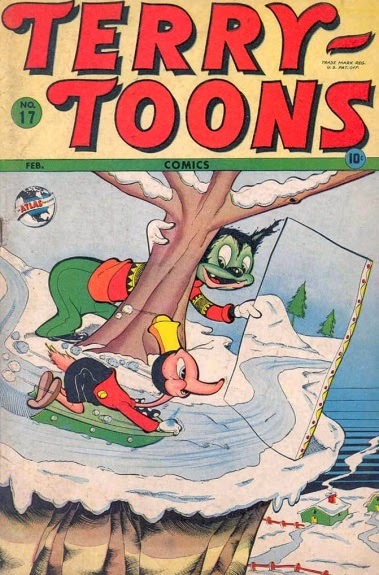 The Blackstone entry above has another connection to Vital, which published a three issue comic book series in conjunction with Street & Smith in 1946. 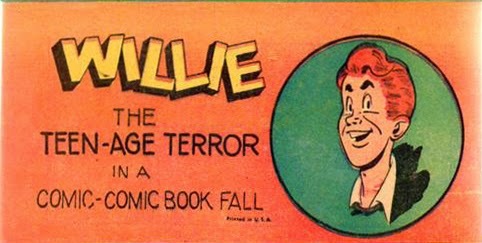 In 1947 EC Comics would publish a single issue of Blackstone and Timely would follow with issues #2 and #3 in 1948, before the mini-comic above appearing in 1950. I mentioned Louis Siblerkleit on several occasions above and want to inform that he attempted to also join in with the rush to digest paperbacks. His line was so small that as a participant, was barely noticed. Silberkleit had two distinct lines, 1943 and 1955. Jumping in the same time as Martin Goodman, the first line had only three releases, with slightly different names. Note the use of the word "selection" once again, the buzz-word popularized by the Hillman digests and co-opted by Goodman. "Run Corpse, Run!!" by Guy Pember Hiller; Copyright 1943 by Close-Up, Inc., 160 West Broadway. 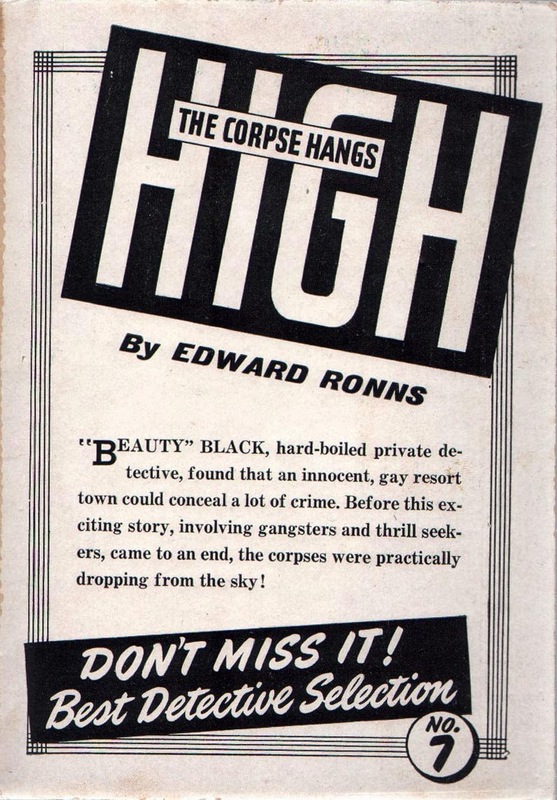 The inside back cover had a "next issue" ad for "The Corpse Wore Nylons", which never appeared. 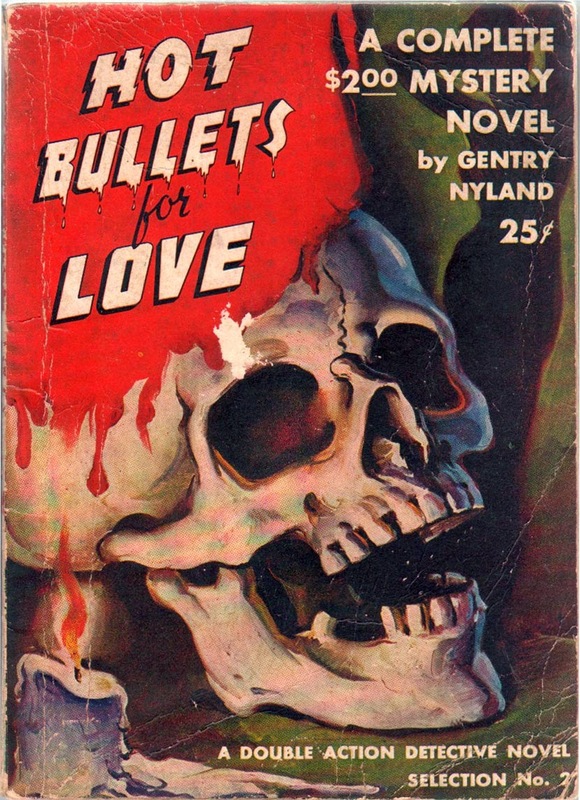 "Hot Bullets for Love" by Gentry Nyland; Copyright 1943 by Close-Up, Inc., 160 West Broadway. "Mr South Burned His Mouth", Copyright 1941 by Gentry Nyland. "Jealousy Pulls the Trigger" by M.E. Corne; Copyright 1943 by Close-Up, Inc., 241 Church Street. 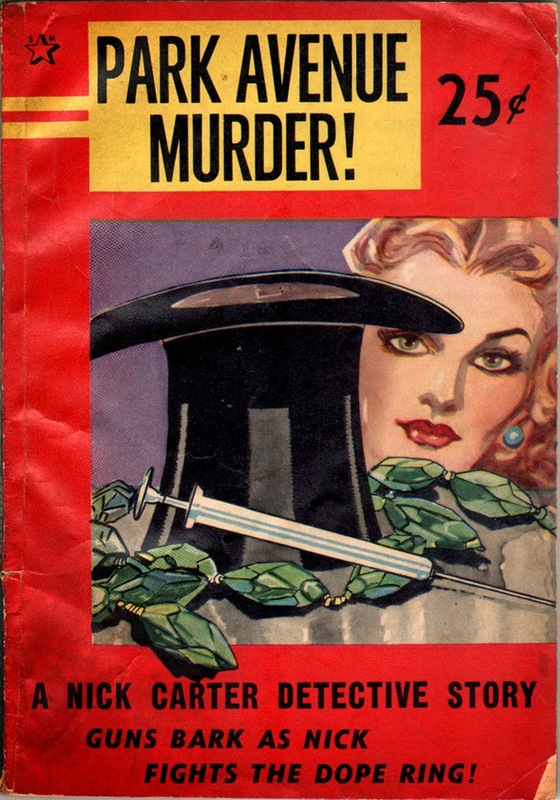 New York 13, N.Y., "A Magnet for Murder", Copyright 1939 by M.S. Mill Co., Inc. 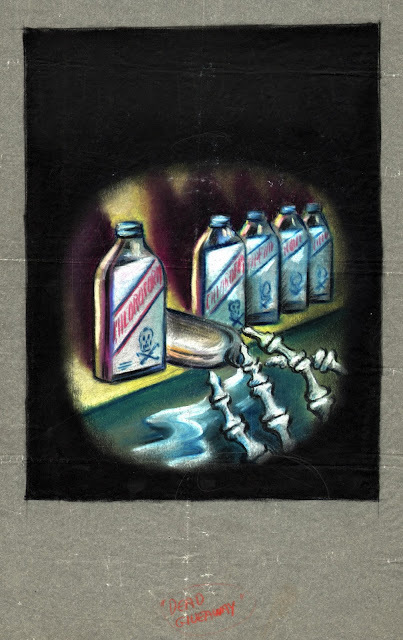 The back cover again was an ad for Silberkleit's true-crime magazines. The 241 Church Street address was Silberkleit's new main operating address starting in 1943. Prior to this he operated out of 60 Hudson Street, which was the same address as the 160 West Broadway address seen above in the first two releases. "The Trigger Tribe" by T.W. Ford; Copyright 1955 by Columbia Publications, Inc., 241 Church Street, New York 13, N.Y. 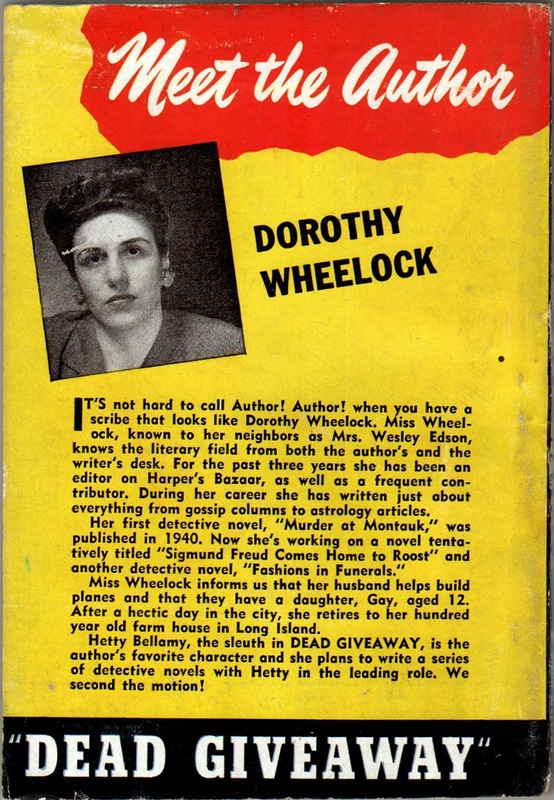 The inside back cover has an ad for "In Self Defense" by Margaret Manners, the 2nd issue of Double-Action Detective, a Double-Action Pocketbook. 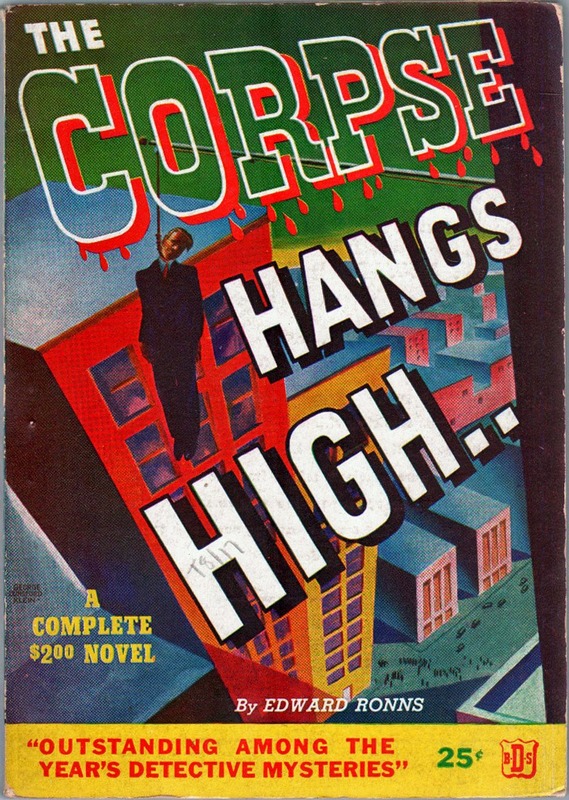 This was not a paperback digest line but a pulp digest line, an ongoing anthology of crime stories edited by Silberkleit pulp editor Robert W. Lowndes, running 24 issues from 1954 to 1960. I suppose the only difference was the fact that the former was a single novel and the latter an anthology. Beyond that, they are exactly the same thing, yet standard paperback references refuse to list them, considering them extensions of pulps, albeit in the digest form. 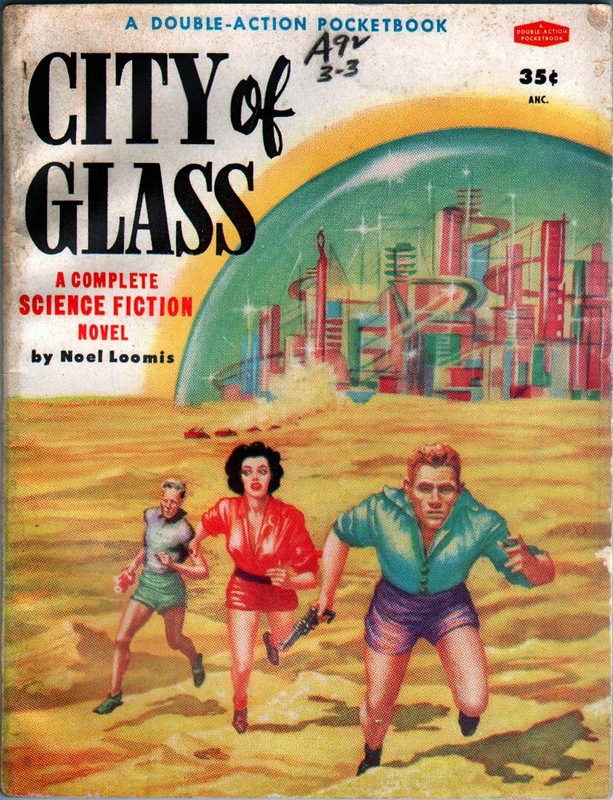 The back cover carried an ad for "City of Glass", a Double-Action Paperback listed below. "City of Glass" by Noel Loomis; Copyright 1955 by Columbia Publications, Inc., 241 Church Street, New York 13, N.Y. Cover art Frank Kelly Freas (attributed). 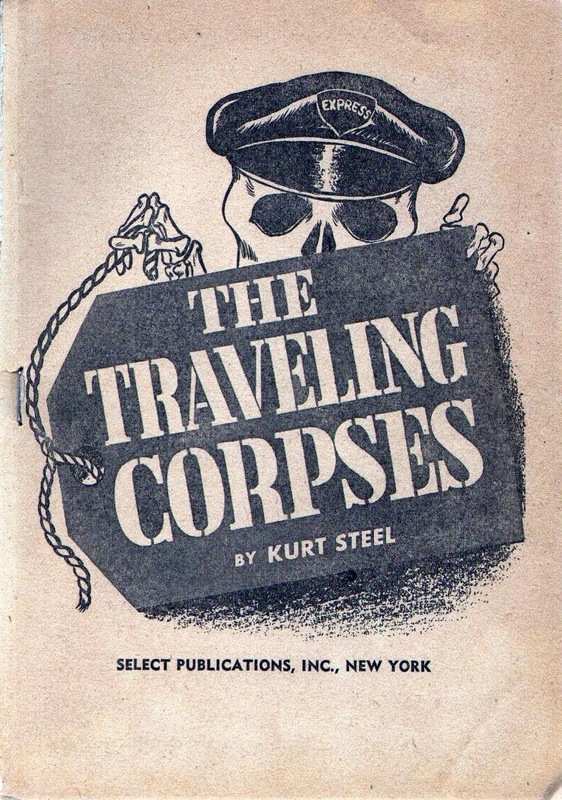 Wail for the Corpses, © 1943, Select Publications, Inc. The Submarine Signaled ... Murder! 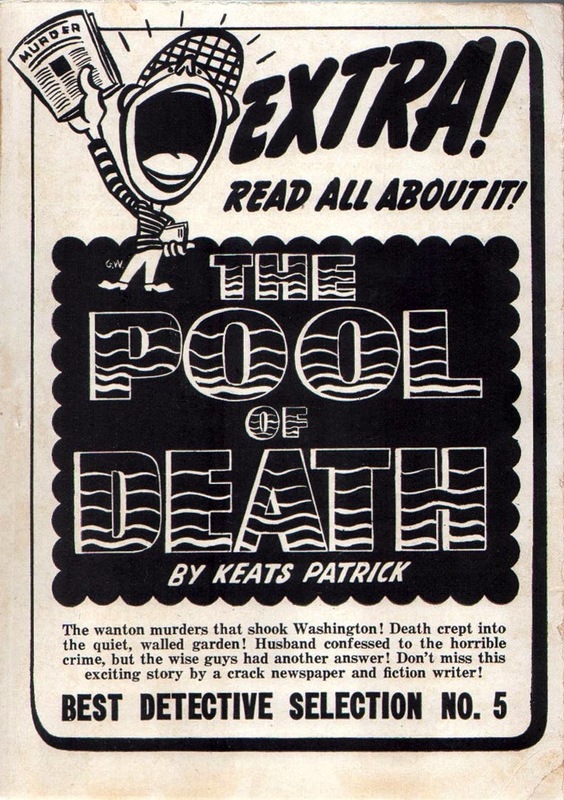 © 1943, Select Publications, Inc.
Death is the Host, © 1943 by Red Circle Magazines, Inc. The Lisping Man, © 1944 by Hercules Publishing Corp. Murder in the House With the Blue Eyes © 1944 by Margood Publishing Corp. Kill One, Kill Two, © 1944 by Mohawk Publishing Corp.
Death Goes Native, © 1944 by Gem Publications, Inc.
Hush Gabriel!, © 1944 by Euclid Publishing Co., Inc.
Shady Doings, © 1944 by Select Publications, Inc. The Corpse Comes Ashore, © 1945 by Zenith Publishing Corp.
Rendezvous With Dead Men, © 1948 by Vital Publications, Inc., Cover - Lee J. Ames. 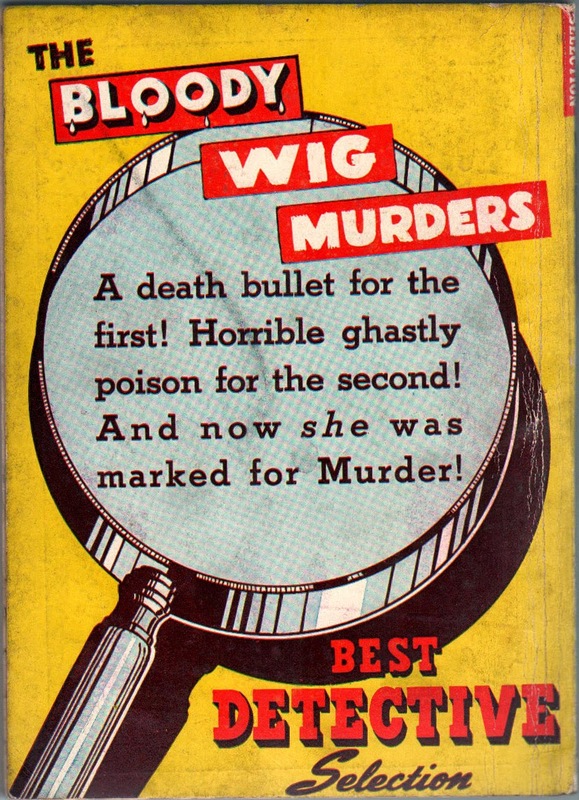 A Blonde For Murder, © 1948 by Current Detective Stories, Inc. Published by Vital Publications, Inc. Cover - Peter Driben (attributed). Open Land Renegades", © 1948 by Vital Publications, Inc.
Hano, Arnold. "The Story of the Paperback Novel"; Writer's Yearbook, 1953. Silberkleit, Louis; Letter to Writer's Digest; April 1942. Pursuant to the provisions of the Federal Trade Commission Act (38 Stat. 717; as amended 52 Stat. 111, 15 U.S.C.A. Sec. 41), the Federal Trade Commission caused an investigation to be made of the methods, acts and practices used by Columbia Publications, Inc., a corporation, Louis H. Silberkleit and Harold Hammond, in commerce as defined by the Act, and from such investigation has reason to believe that the aforesaid corporation and individuals have been or hare using unfair methods of competition nd unfair and deceptive acts and practices in commerce in violation of the provisions of said Act. PARAGRAPH ONE: Columbia Publications, Inc., is a New York corporation, with its place of business in the city and state of New York. Louis H. Silberkleit and Harold Hammond are co-partners trading as “Atlas Fiction Group, Inc.,” with their place of business in the city and state of New York. The said Louis H. Silberkleit has formed or organized, or caused to be formed or organized, numerous corporations which he dominated and absolutely controlled. Most of the corporations so formed or organized by the said Louis H. Silberkleit have become obsolescent and the business which they formerly conducted is at the present time being operated or conducted by the aforesaid Columbia Publications, Inc., which is controlled and dominated by the said Louis H. Silberkleit. At all times herein referred to, they have been in competition with corporations, individuals, partnerships, and firms likewise engaged in the sale and distribution, interstate commerce, of similar products. (2) Using or substituting a new title for or in place of the original title of a reprinted story unless, whenever used, whether on the title page, at the beginning of the text of the story or elsewhere, such substitute title be immediately accompanied in equally conspicuous type by the title under which such story was originally published. (5) Representing, by the use of the word “copyright” or any other word or words of similar import or meaning that any story, article, magazine, book or publication which has not been copyrighted is or has been copyrighted. IT IS ALSO STIPULATED AND AGREED that if the said Columbia Publications, Inc., and Louis H. Silberkleit and Harold Hammond, or any one of them, should ever resume or indulge in any of the aforesaid methods, acts or practices which they have herein agreed to discontinue, or in the event the Commission should issue its complaint and institute formal proceedings against the respondents as provided therein, this stipulation as to the facts and agreement to cease and desist, if relevant, may be received in such proceedings as evidence of the prior use by the respondents of the methods, acts or practices herein referred to. Stipulation No. 3366 dealt with Newsstand Publications, Western Fiction Publishing Company, and Manvis Publications of New York City. And lastly, Martin Goodman didn't learn his lesson. In a letter to the September 1947 Writer's Digest, the Federal Trade Commission itself once again called Goodman to task for doing the exact same thing. Misrepresentation in the sale of books and other publications is prohibited in a cease and desist order issued Martin Goodman and Jean Goodman, co-partners trading as Magazine Management Co., 30 Fifth Avenue (sic, should be 350 Fifth Avenue), New York, and 12 subsidiary Publishing Corporations. Representing that books or other publications contain original, complete or unabridged novels, stories or articles when such is not a fact. Failing to adequately inform dealers and the public of the condensation, abridgement or alteration of novels, stories or articles contained in the respondent’s books or other publications. The commission found that the respondents falsely represented that their books and other publications contained original, complete and unabridged novels, stories or articles. In a number of instances, the covers of the publications bore the words, “a complete $2.00 novel,” or other words of like import, according to the findings, which add that actually the publications contained condensed, abridged or altered versions of previously published material. Changing the title of novels, stories and articles without properly disclosing that such changes have been made was another practice found to be deceptive. The result of this practice, the findings state, was that purchasers were misled into buying the respondents’ publications containing condensed or abridged versions of novels, stories or articles read previously by them, which they would not have bought if the material had been properly identified as to the titles used when originally published. Even where the publications contained notice of condensation, abridgement or change of title of the original material, it was set forth in fine print on an inside page and was insufficient adequately to inform dealers and the public that such alterations had been made, the findings declare, adding that such notices were “frequently contrary” to statements appearing on the covers of the publications. An order to cease and desist was issued, with the concurrence of all the Commissioners, after the respondents filed an answer admitting all the material allegations of fact in the complaint and waived all intervening procedure and further hearing. Thanks, Bob! I do plan to do something with the Goodman men's mags but my main interest is the debut in 1949 up through the 1950's. The 1960's and beyond interest me less. I suspect that the Julien Proskauer connection might have something to do with Wm C. Popper & Co. a printing company that Proskauer controlled during this time. .
George Dunsford Klein: same guy that inked FF #1? Same guy. He was a Timely staffer at the time. 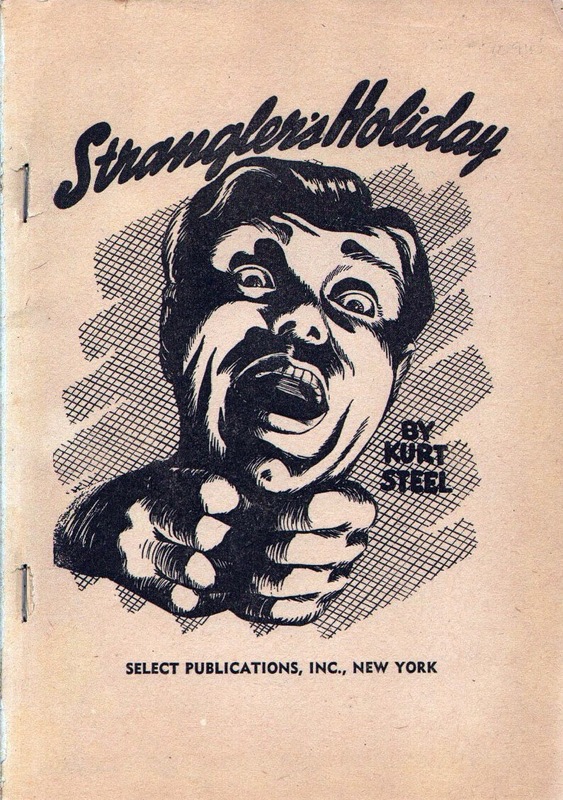 "....There were a slew of publishers who jumped on this paperback digest bandwagon. 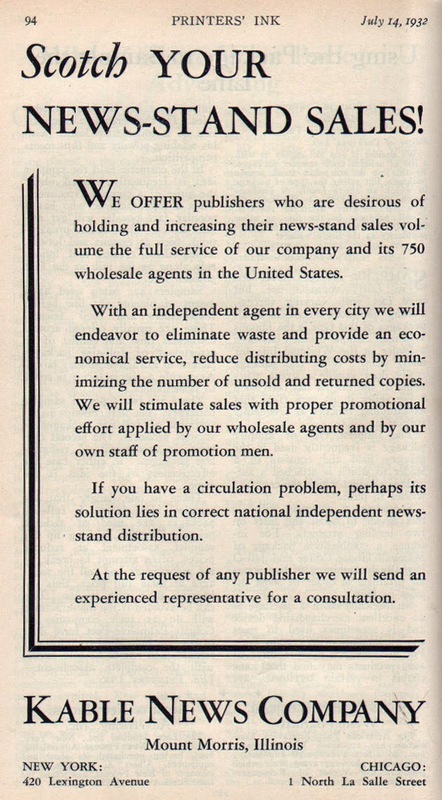 One of the small, barely-leaving-a-ripple-in-the-industry type of publishers was a company called Vital Publications. The owner/president of Vital was Julien J. Proskauer and he published out of a 148 Lafayette Street address. Proskauer was an author of minor note (The Dead Do Not Talk, 1946), a friend of Harry Houdini and one time President of the American Society of Magicians, who actively engaged in debunking mediums and exposing spiritualism frauds. ".....In 1945 and 1946 he published a series of 4 Nick Carter detective story digests which, according to a blurb on the inside, were ... Reprinted by special arrangement with Street & Smith Publications, Inc....."
What is interesting to note re Vital is this owner guy also publsihed the first few no number Quality Comics of The Spirit as well as the first couple Plastic Mans if I remember correctly without slowing down to look em up. Those five all have that "Vital" stuff on their back covers as well. They all date to 1944/45 as well. Me thinks this Vital ownewr had an access to paper allocations which made him other people's "best friends" while the paper clamp downs were in place during World War Two. WHat is "new' to me here is his Martin Goodman conenction. Thanks for posting this! Beautiful stuff Doc, I really love those Driben covers! I only know him as a pin-up artist, but his woman are distinctive. Nice research and a great bunch of books too! Of all of them I only have the Death has Green Eyes the NC Vital Novel, must have got some distribution to get out here to WI. I found it at a Flea, never ran across the Atlas titles, or I would have bought them too. May have to read that Green Eyes book sooner rather than later. were the Galaxy Novels of the 50s, so this was new and interesting. decided to compare pulp titles to the paperback titles. similar. The author is Wormser. page to compare with any of the paperback stories." Thanks for all the research you've put into this blog. Thanks, Brian! You've added to the history I've tried to outline. It's much appreciated. me, implies that 'Nicholas Carter' is a pseudonym owned by Richard Wormser. they all appeared as by Nicholas Carter. appeared under his own name. That's how it's done, folks! My copy of "The Yellow Disk Murder" has the Independent News on the top of the spine. How does this tie in to the "K" on the cover signifying "Kable" as the distributor?